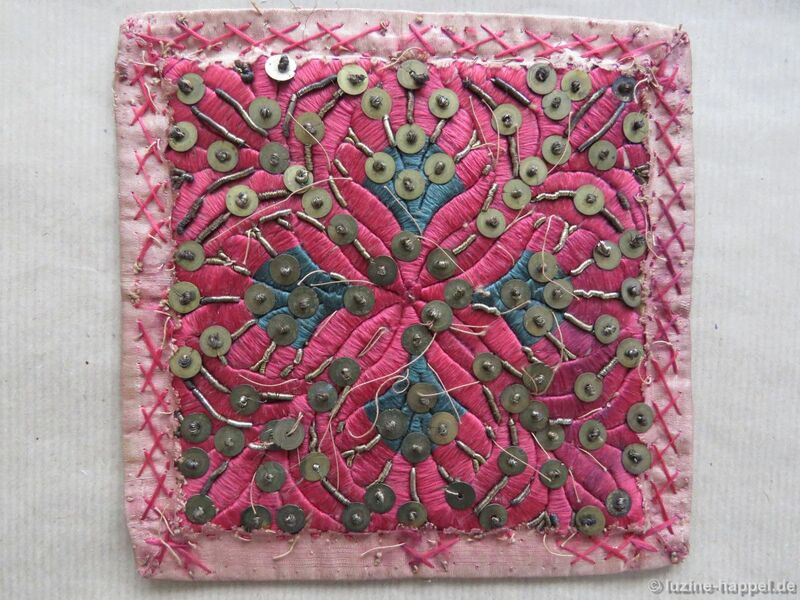 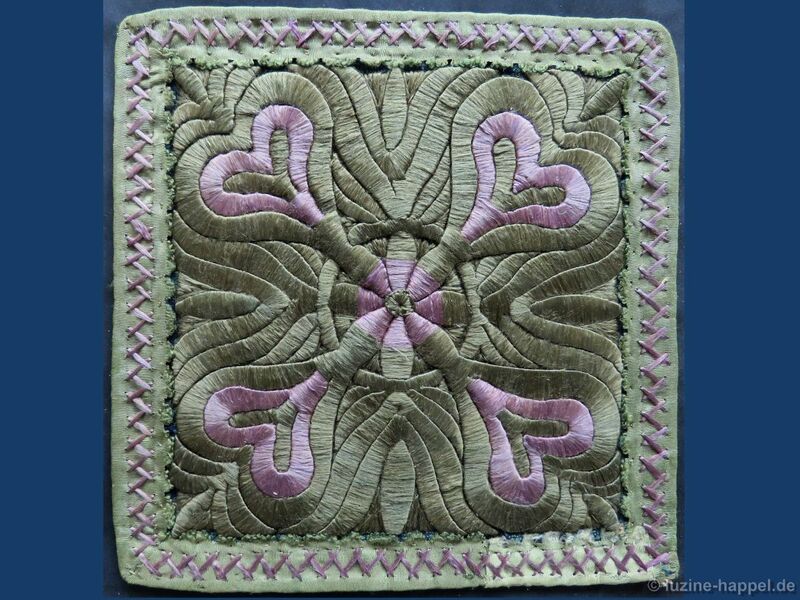 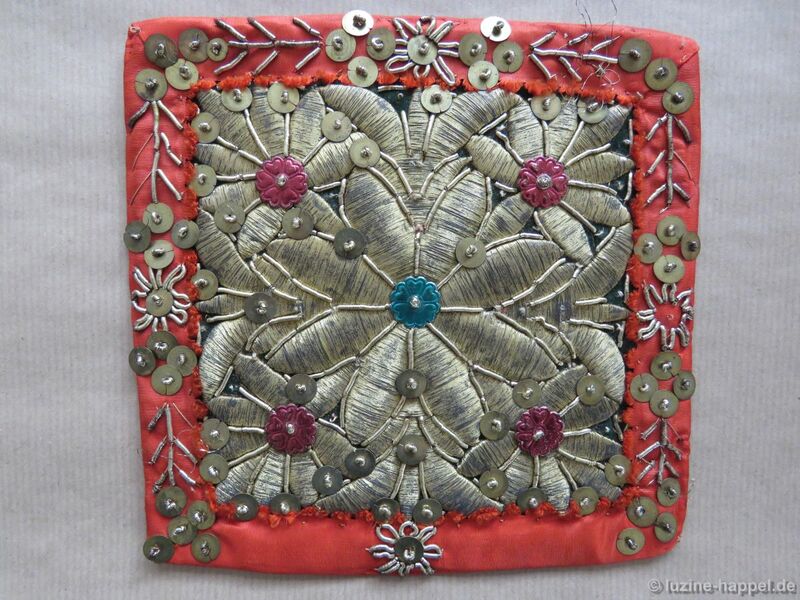 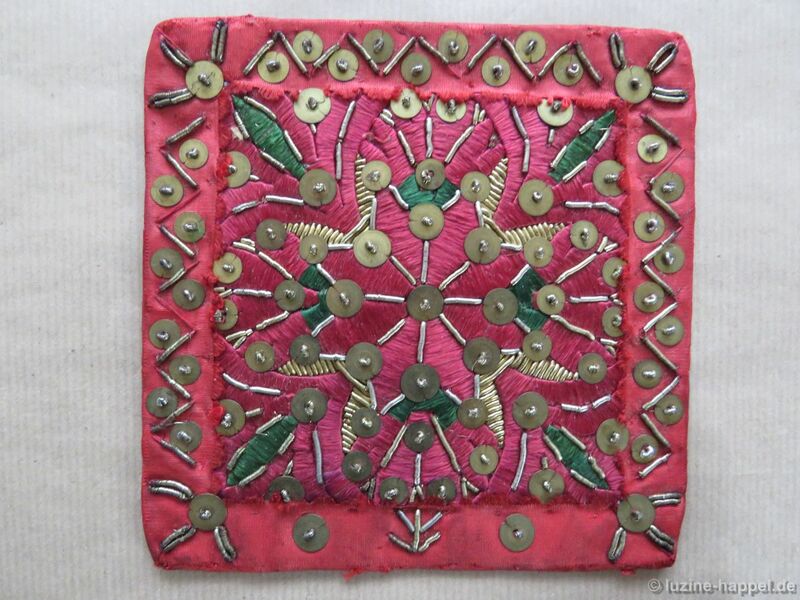 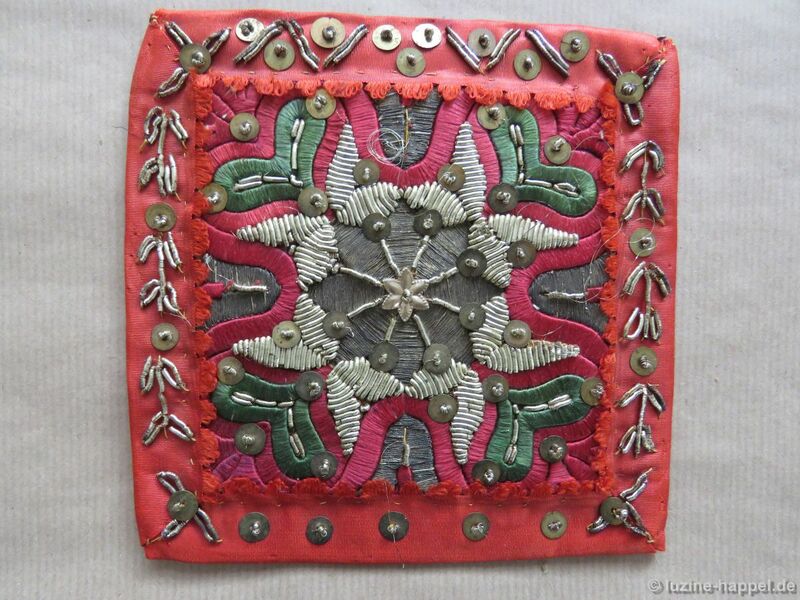 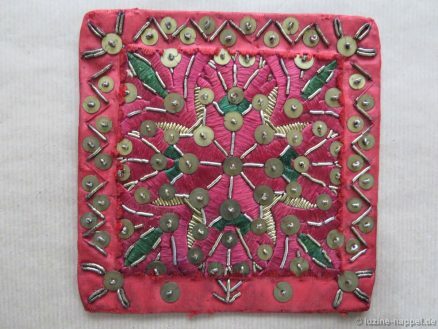 There are even more stunning apron squares from the late nineteenth century. 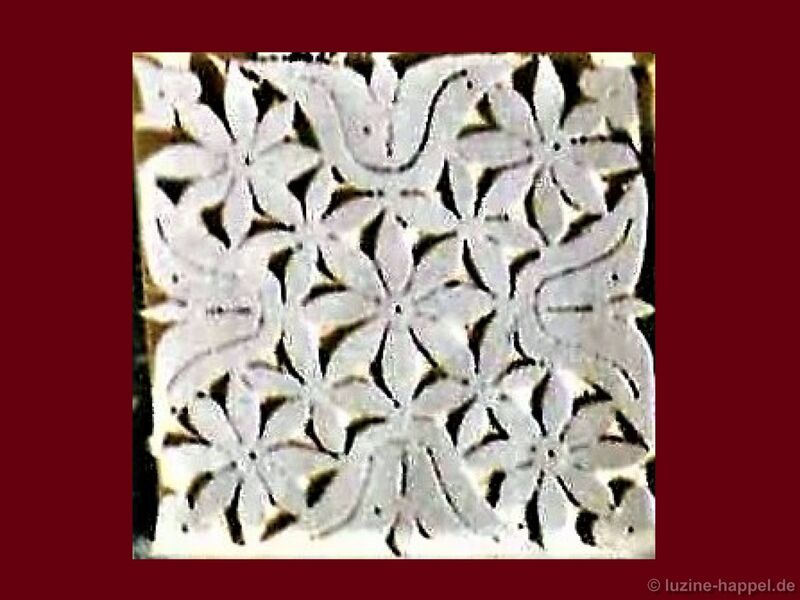 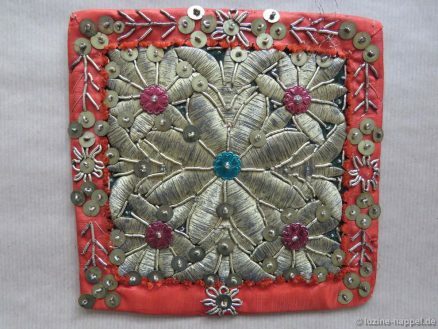 During this time, the measurements of the squares grew (up to 19 cm X 19 cm) and the adornment became more and more splendid. 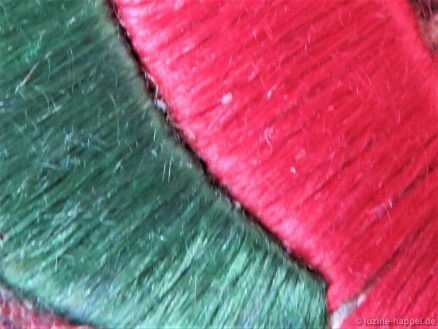 They were made in red and green to match the Schwalm costumes. 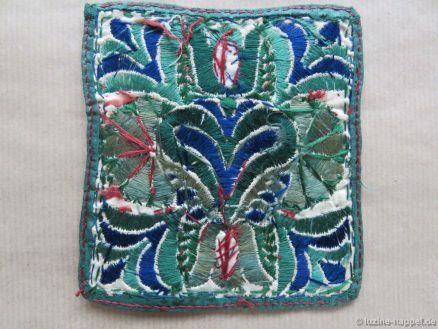 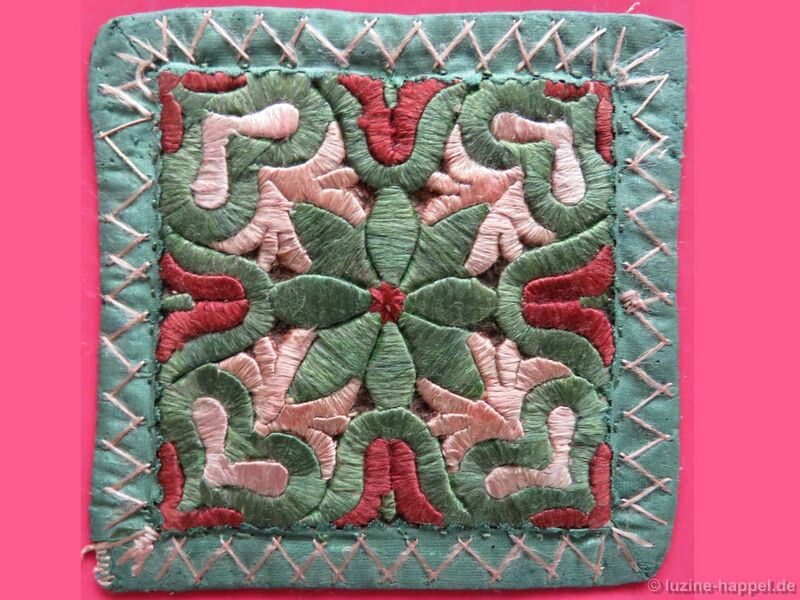 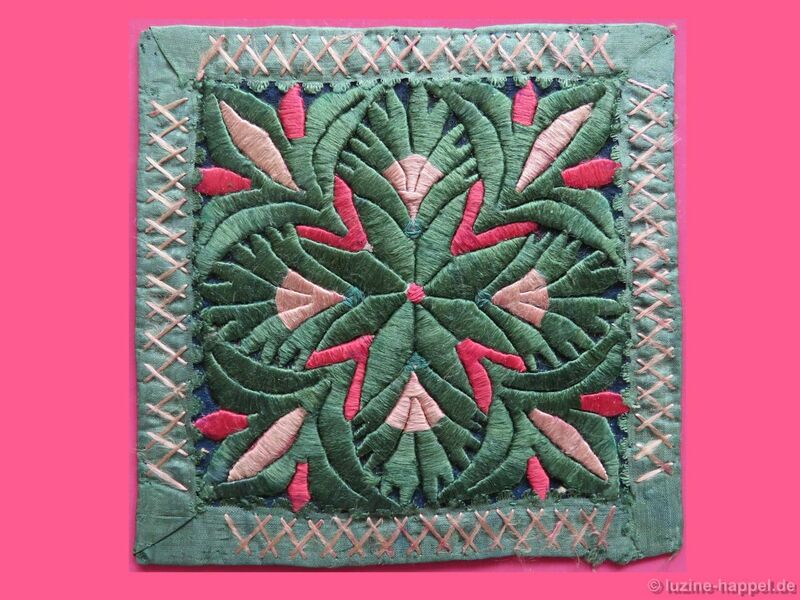 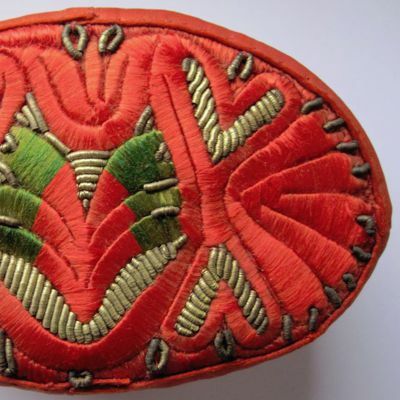 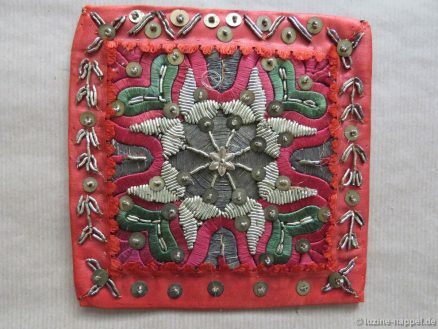 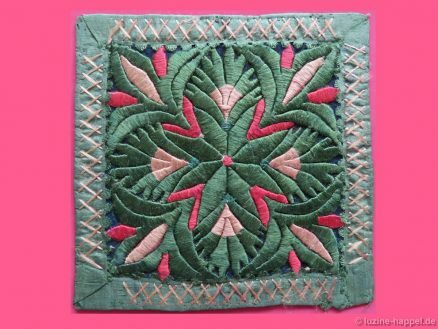 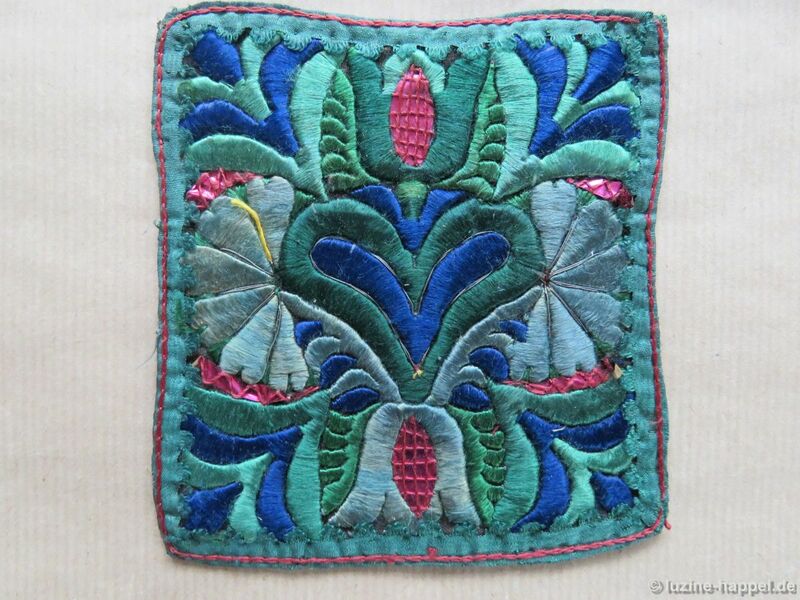 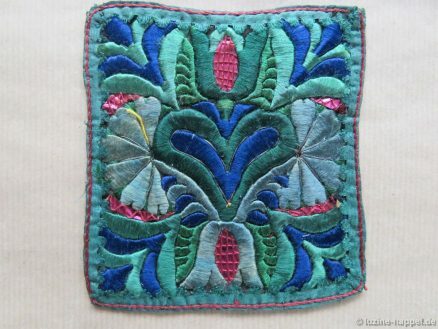 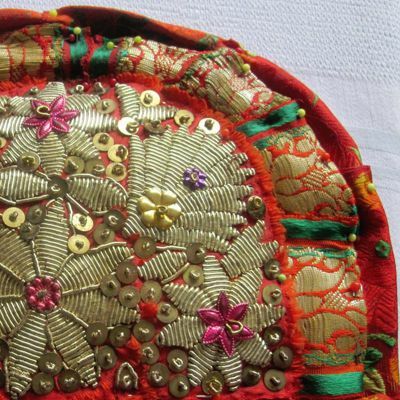 The red apron squares had fine silk embroidery consisting mainly of red sections – but included some green areas, too. 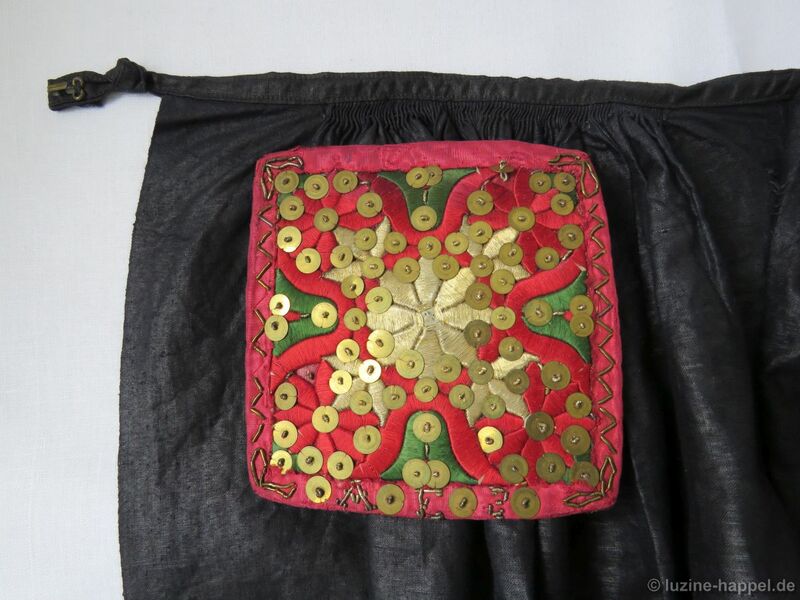 They were additionally adorned with gold – gold sequins and gold bullion. 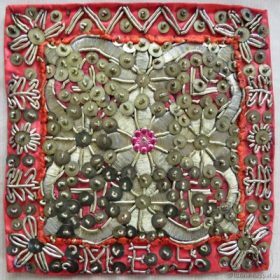 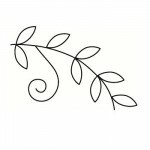 In addition, the edge decoration became more and more elaborate and magnificent. 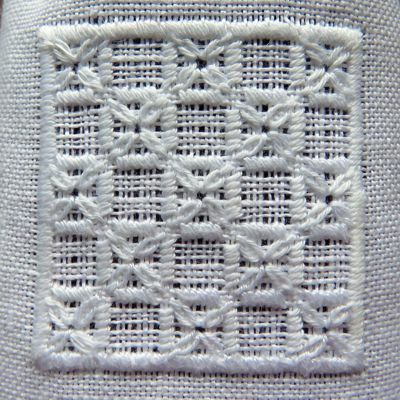 Often the initials of the owner were added at the bottom edge. 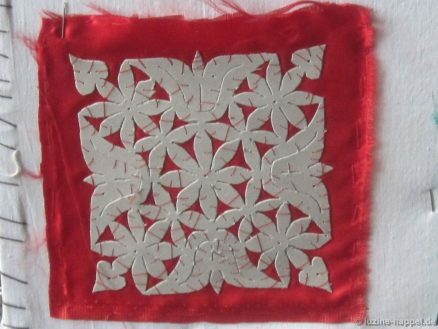 In the end, apron squares were only recognized as red apron squares by the red edging. 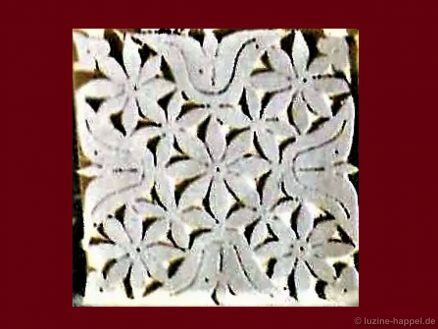 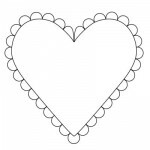 Still visible are the Schwalm-typical motifs (star, tulip, and heart) and the important carnation motif. 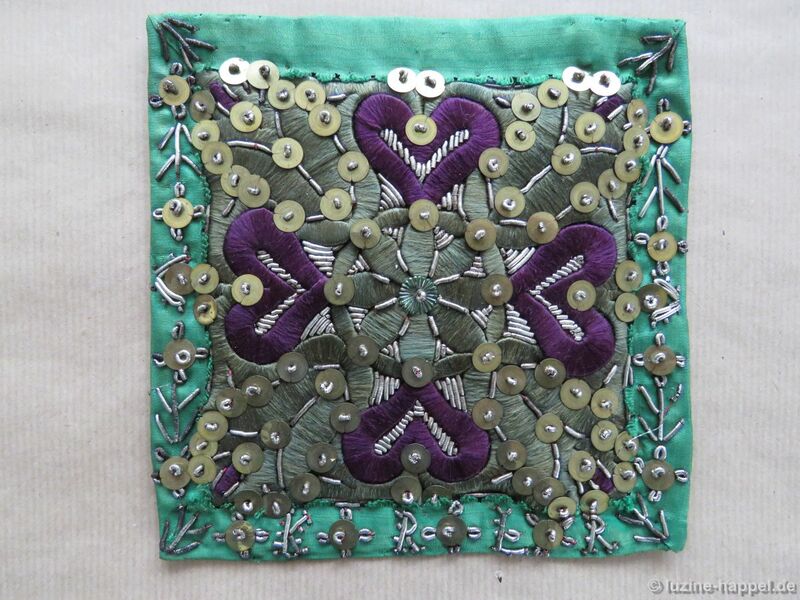 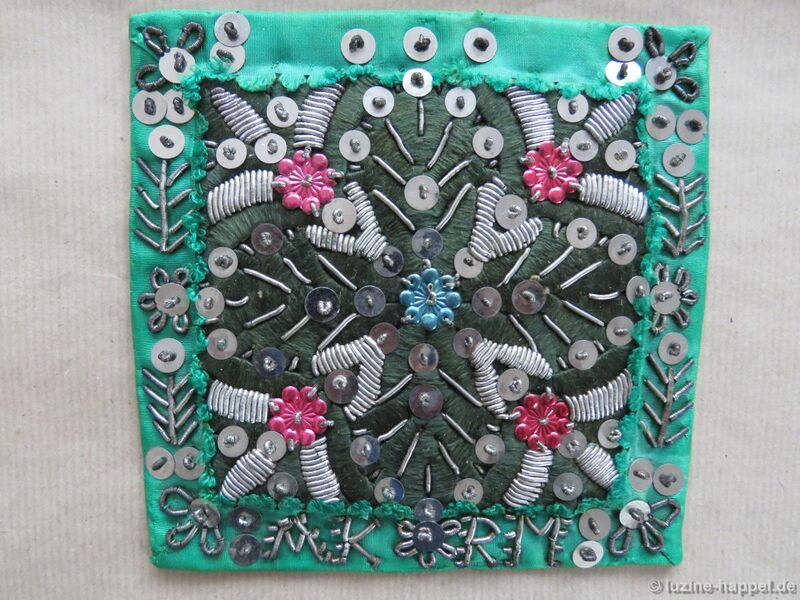 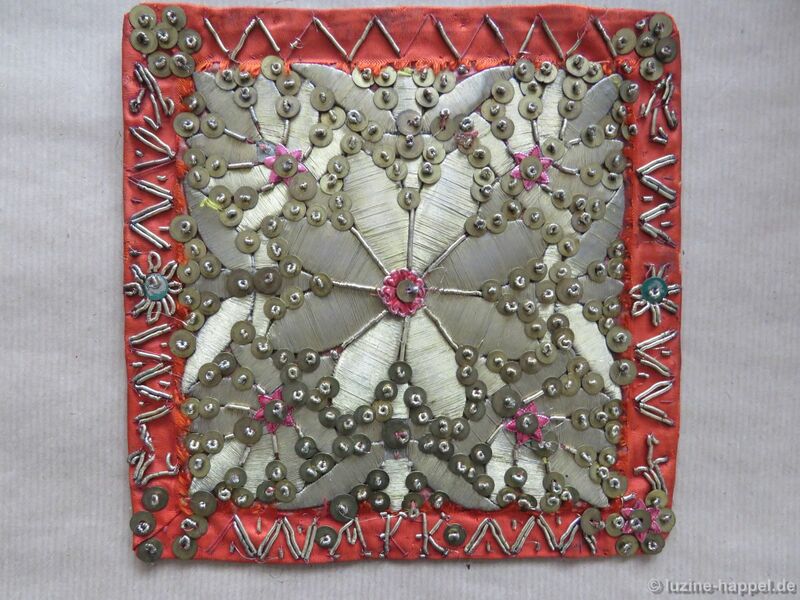 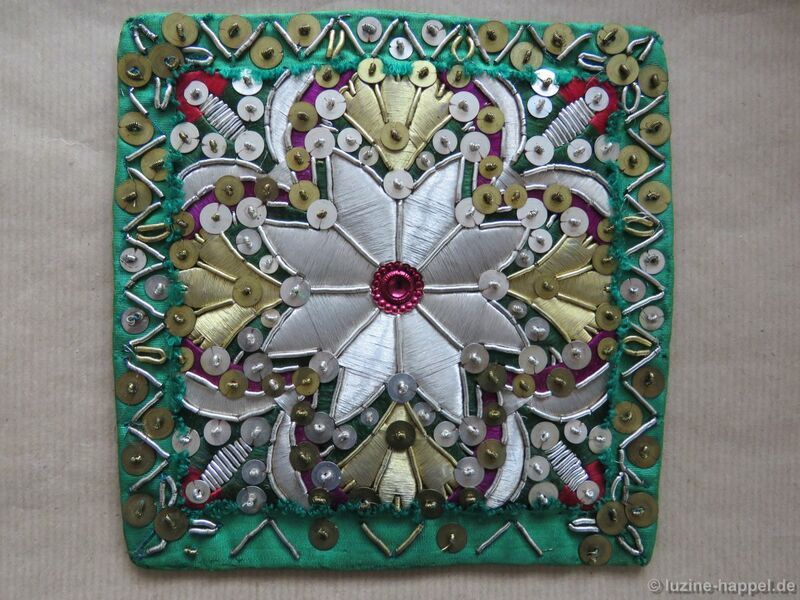 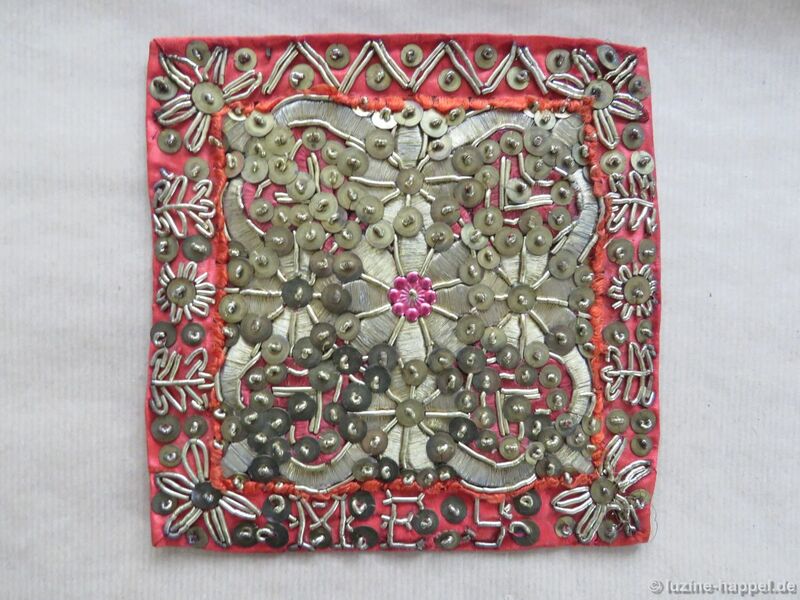 The green apron squares were embellished with silver wire and silver bullion. 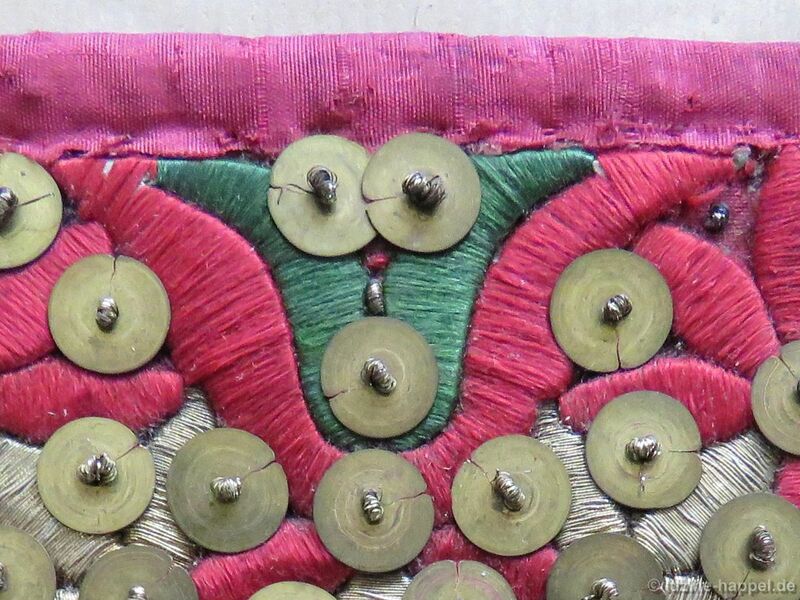 Additional red embellishments can be found on the costumes for younger women. 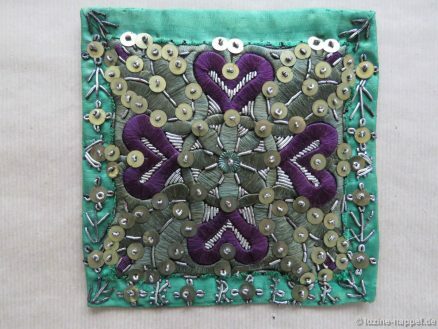 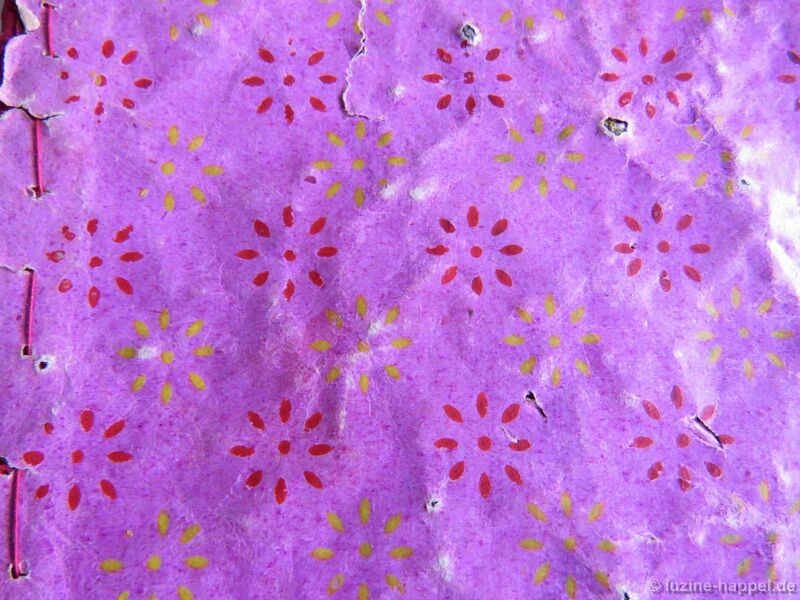 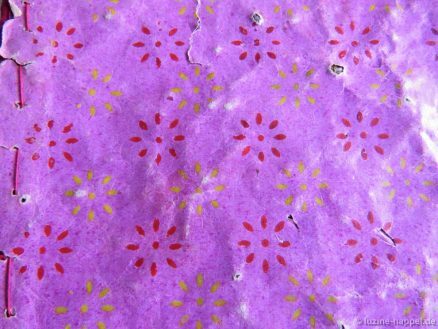 And lilac embellishments are found on the costumes for older women. 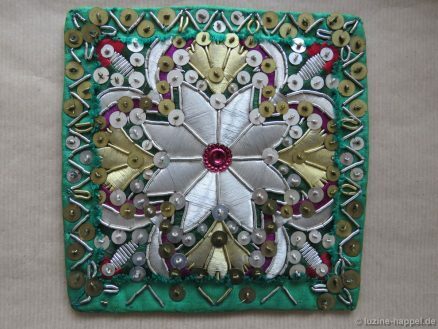 The most stunning examples had both silver and gold with green at the edges and a little bit of red on the inside. 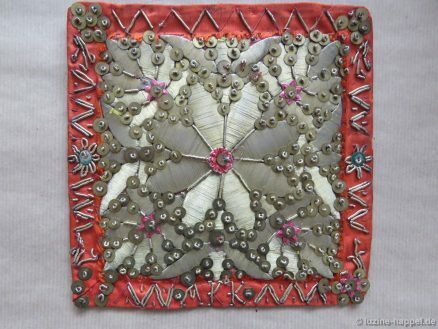 These apron squares are one more accessory that brings magnificence to the Schwalm costume. 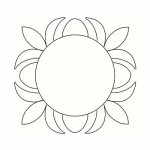 They are really superb, aren’t they? 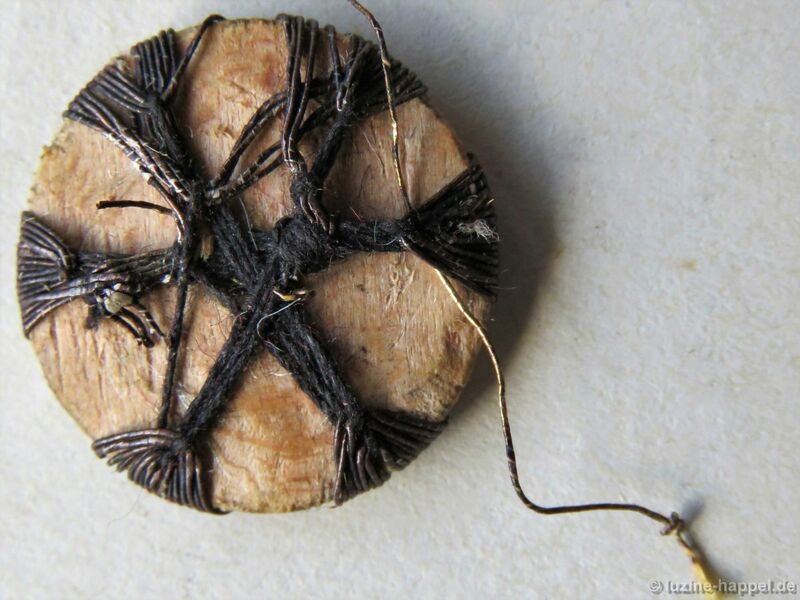 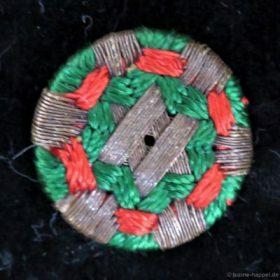 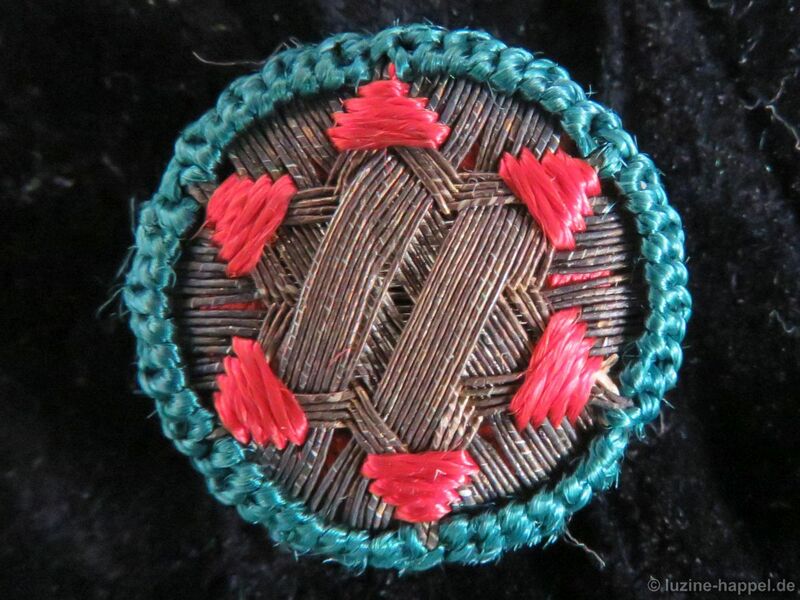 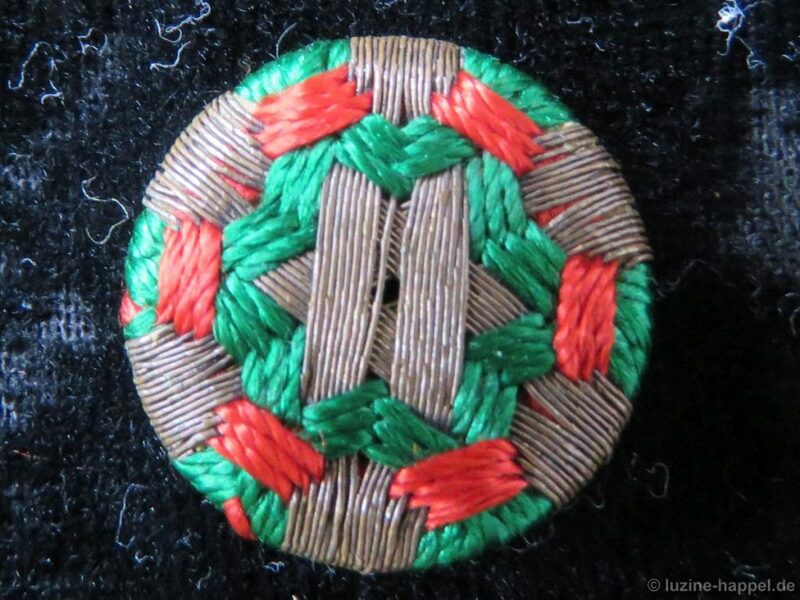 I have in my collection a typical Schwalm passementerie button that is slightly damaged. Because it is not in pristine condition, I decided to unstitch it to see exactly how it was made and the materials that were used. 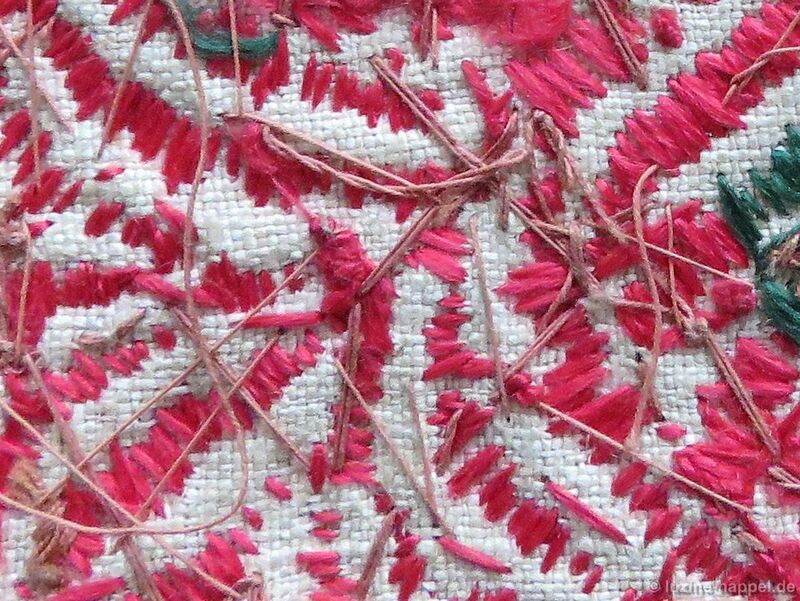 Photos were taken while re-working. 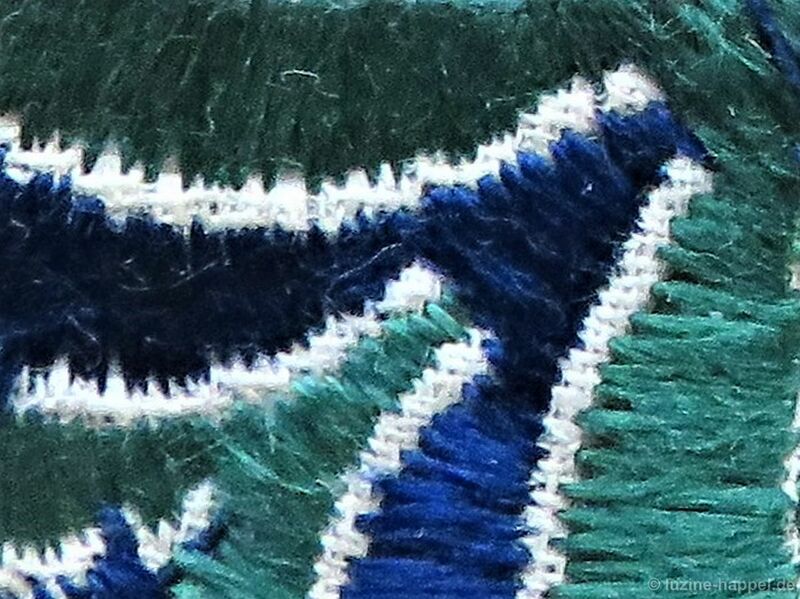 They are now shown in the reverse order. The tape measure allows one to imagine the fineness of the threads. 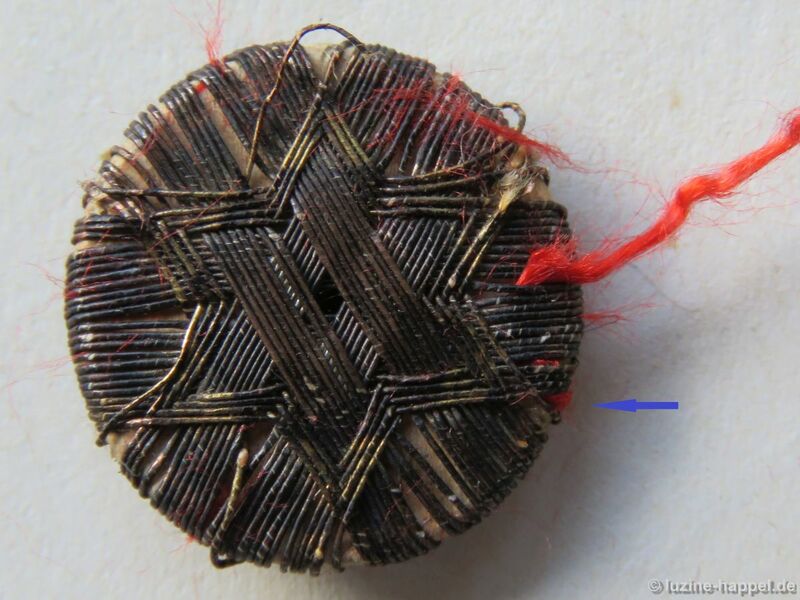 The disc has a diameter of 1.8 cm. 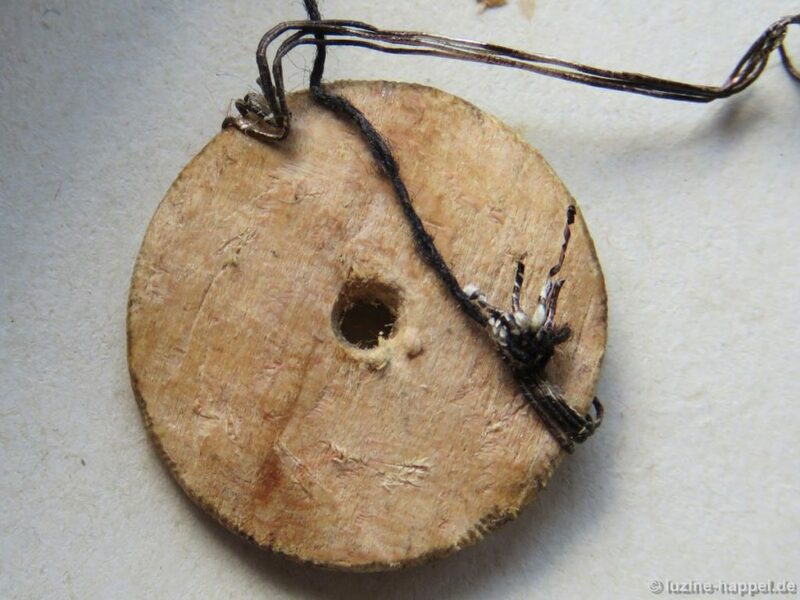 The wood is from the beech tree. 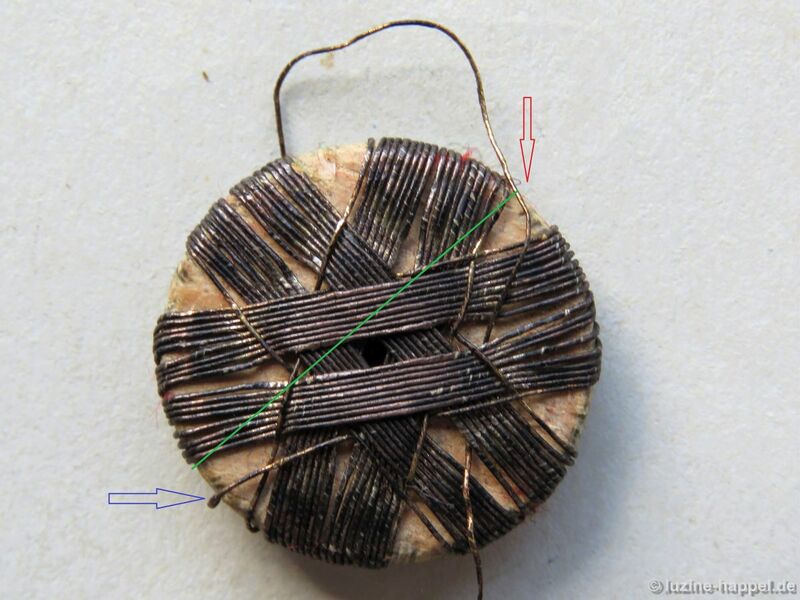 The left image – the front of the disc – shows indentations on the edges caused by the tightening of the wrapped metal threads. 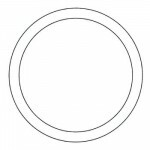 I cannot see division marks on the front or the back sides. 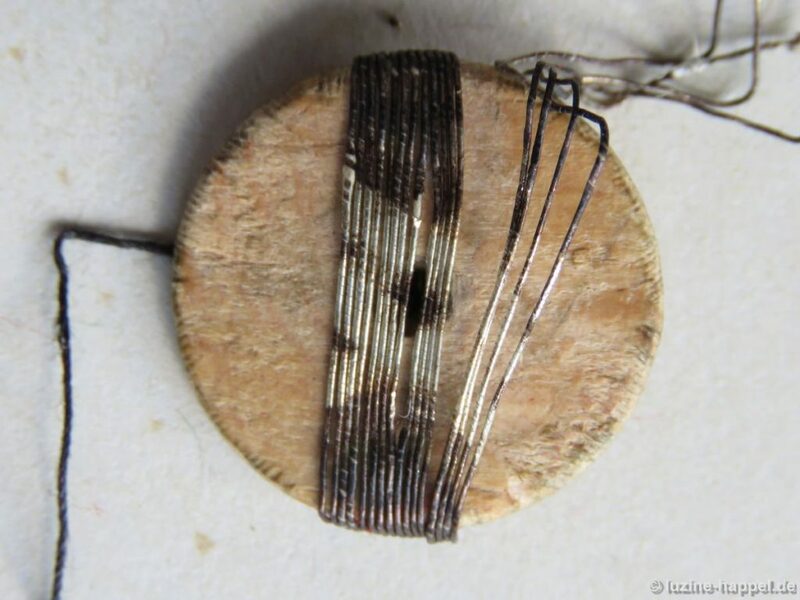 To the naked eye a difference in the thicknesses of the metal threads is imperceptible, but a difference can be felt when the threads are held between two fingers. 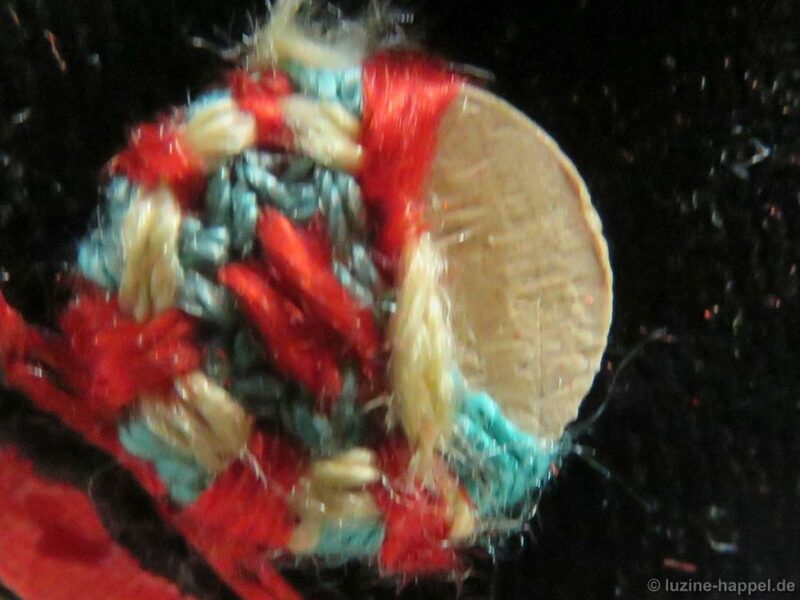 The thread for wrapping feels stiffer. 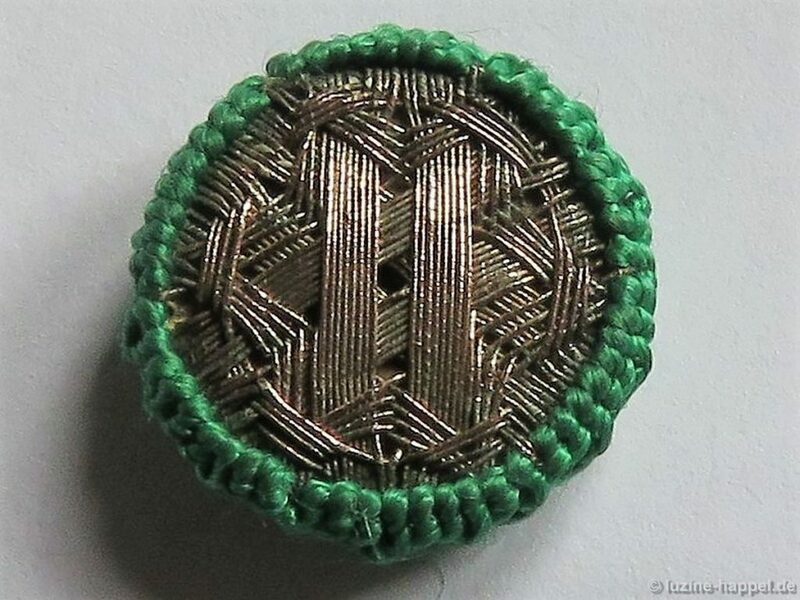 I found the difference when I untwisted the threads. 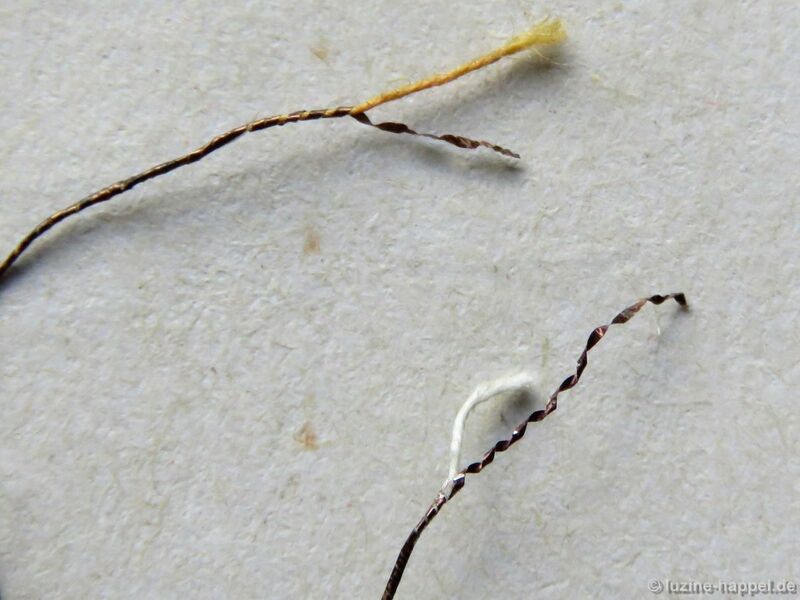 Both metal threads had different twisted cores that were wrapped with a metal band. 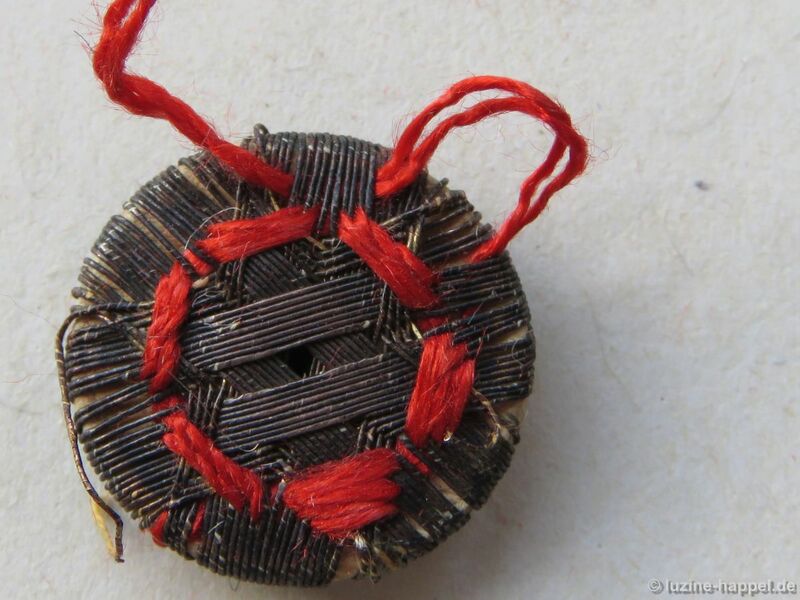 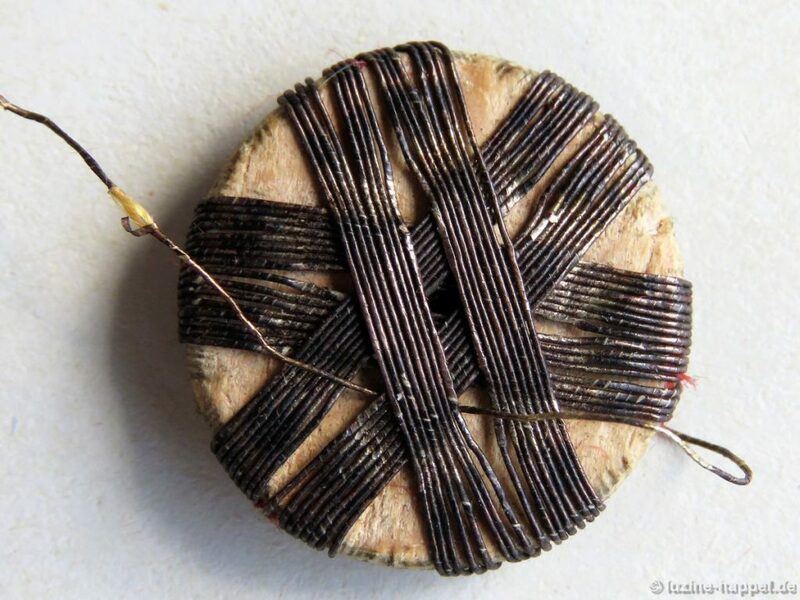 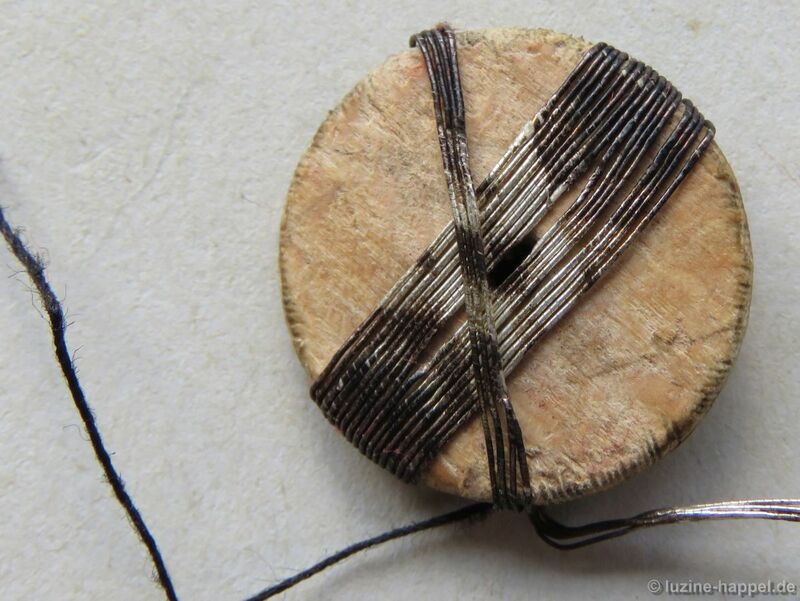 The metal band on the thread used for wrapping the disc (white core) was more closely wrapped around the core than on the thread used for the weaving stitches (yellow core). 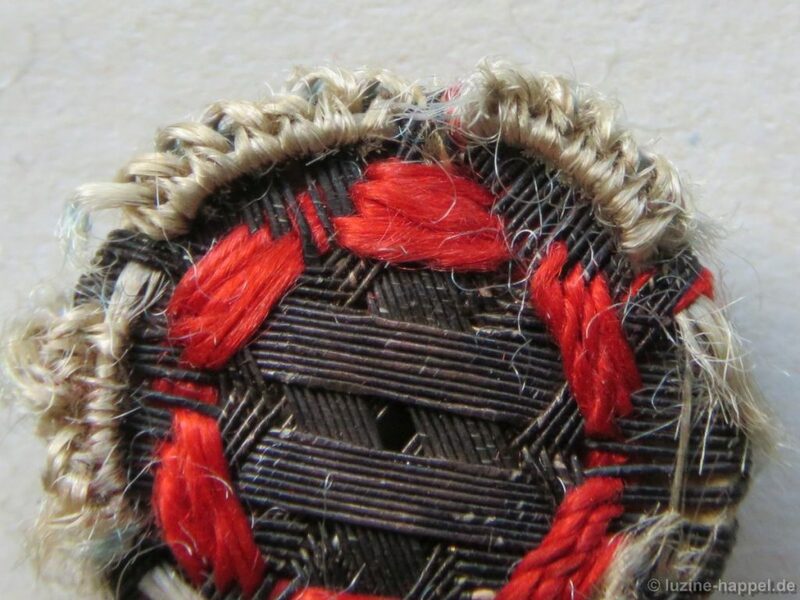 So the threads used for wrapping were more stable (the top thread in the picture below). 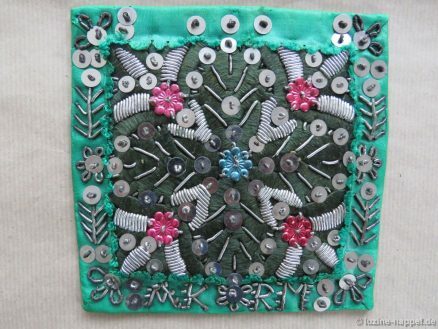 Button making was a stand-alone trade at the time. 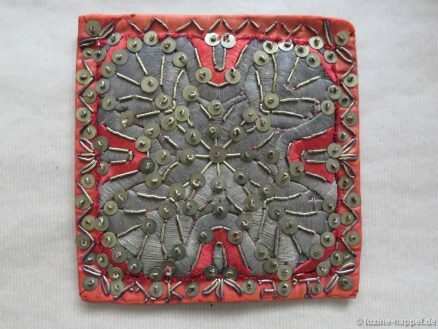 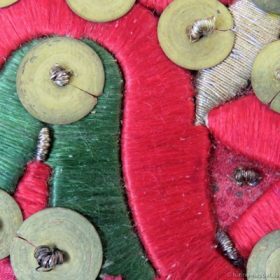 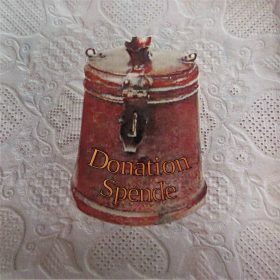 It is chronicled that a Konrad Plannet, button maker master in Schwalmstadt-Treysa, in the middle of the 19th century needed 12–14 hours to work about twenty buttons. It is hardly surprising because he had to twist carefully and exactly all the necessary threads first. 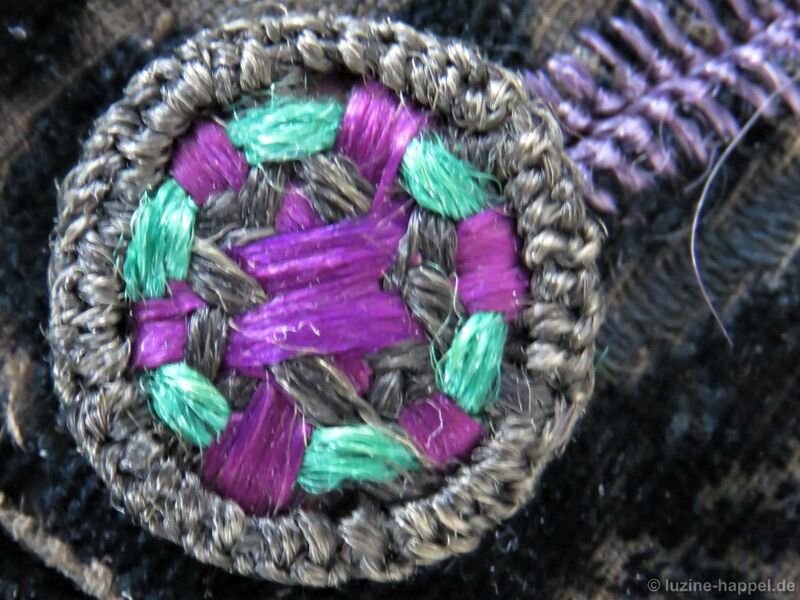 The ends of four silver threads were knotted together with a black linen thread. 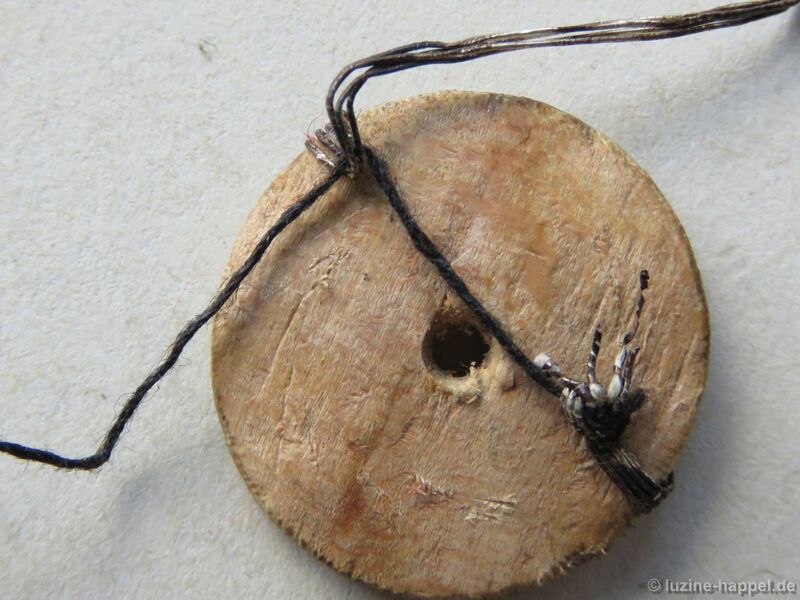 The knot was positioned at the back of the wooden disc, approximately in the middle between the center and the edge. 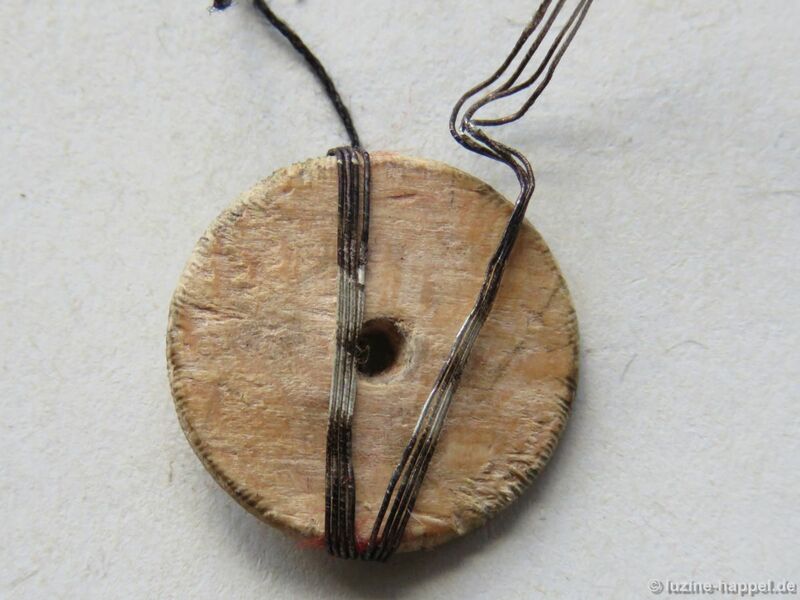 The metal threads were laid around the disc so that all four threads lay densely parallel and beside the center hole. 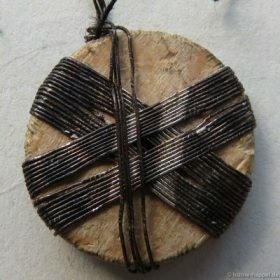 and laid again across the front of the disc, parallel to the first but this time on the opposite side of the center hole. 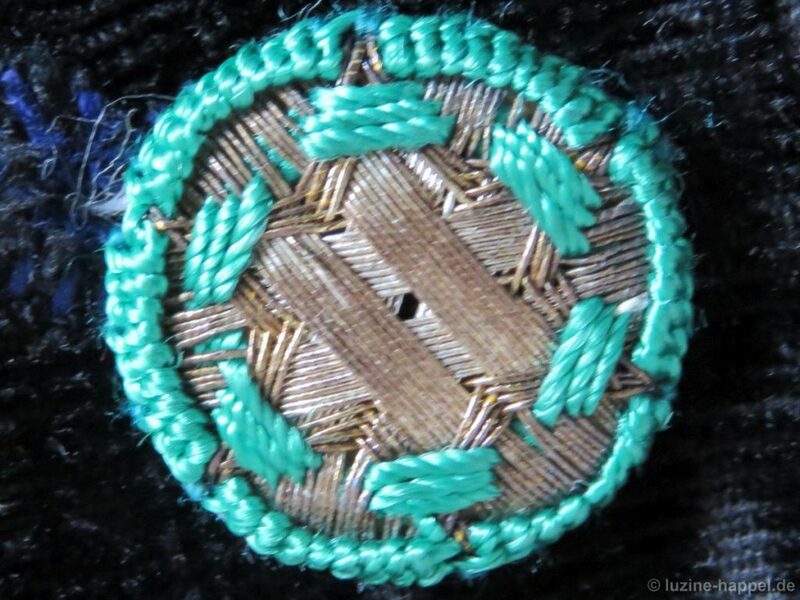 and again after rotating 30° clockwise twice. 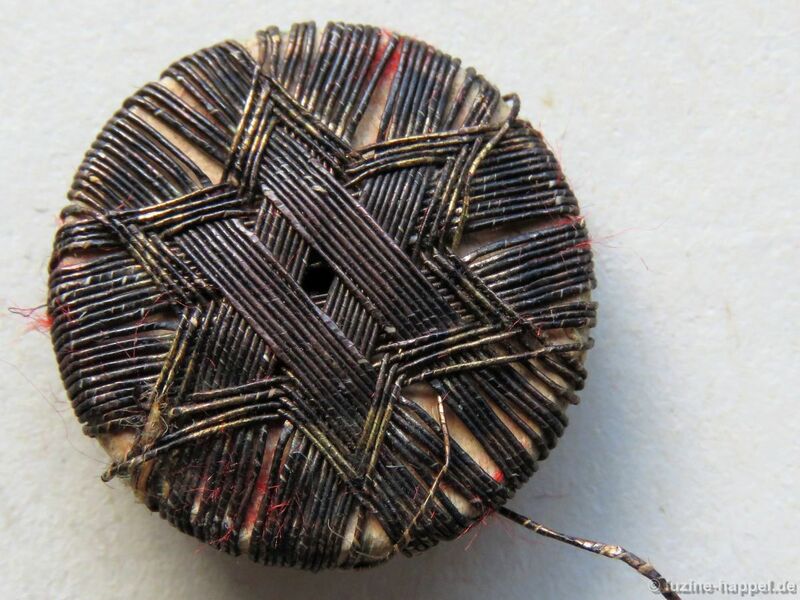 On the back all metal thread bundles were held in place and stretched with the black thread. 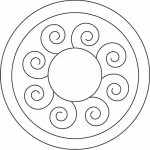 It is clearly visible that the curve of the first two bundles is closer to the edge than the curve of the second two bundles. 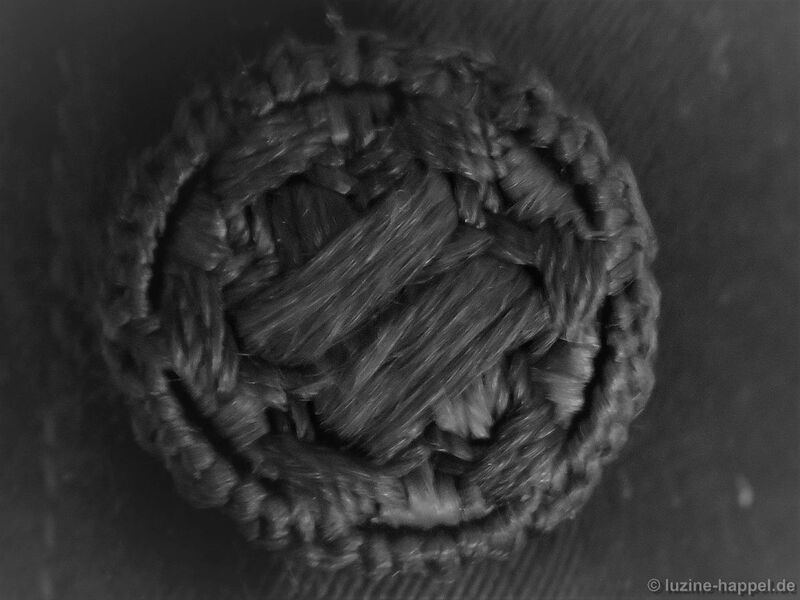 And the thread bundles leading from one section to the next were laid in a curve that nearly reaches the center. 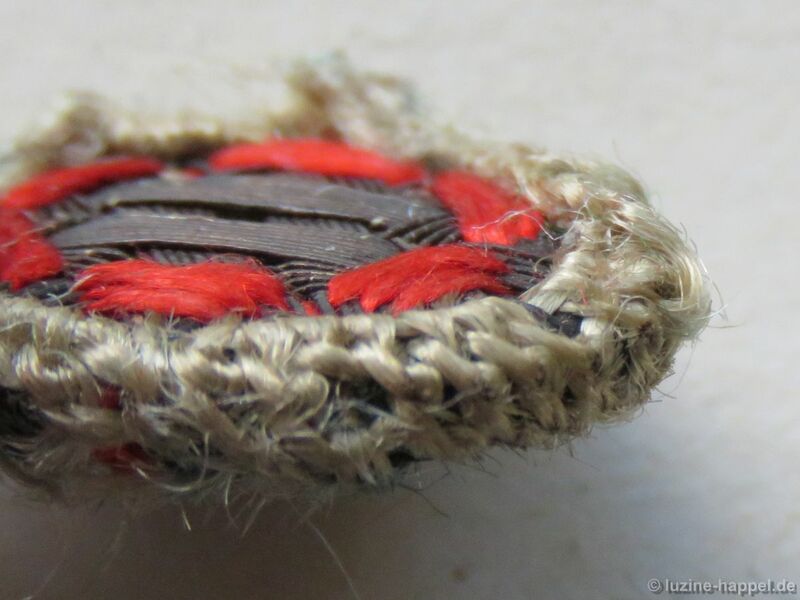 In this way bulky areas on the back of the button were avoided. 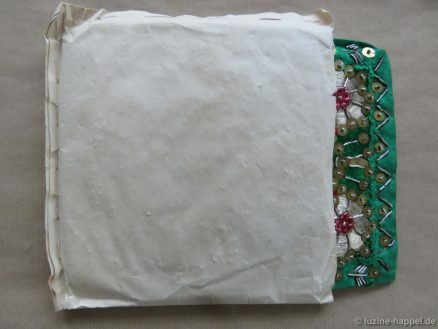 The thread ends were wrapped many times and then cut. 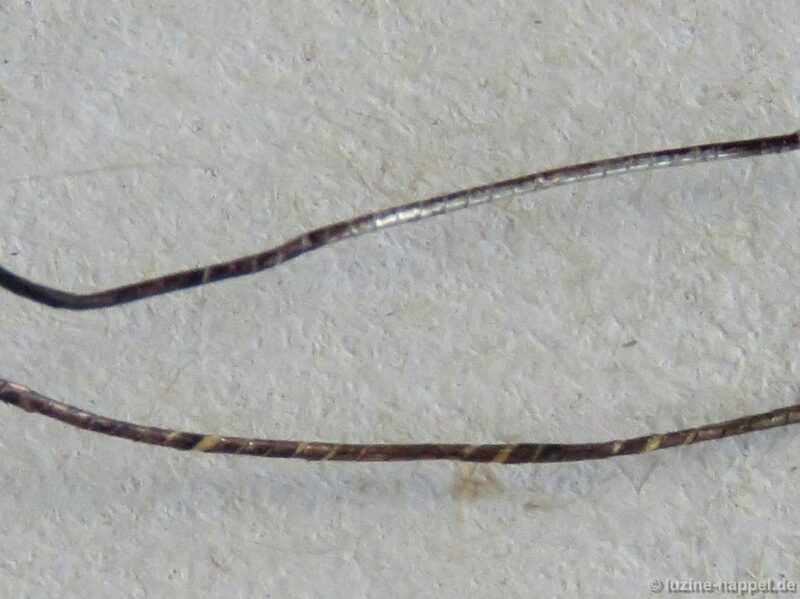 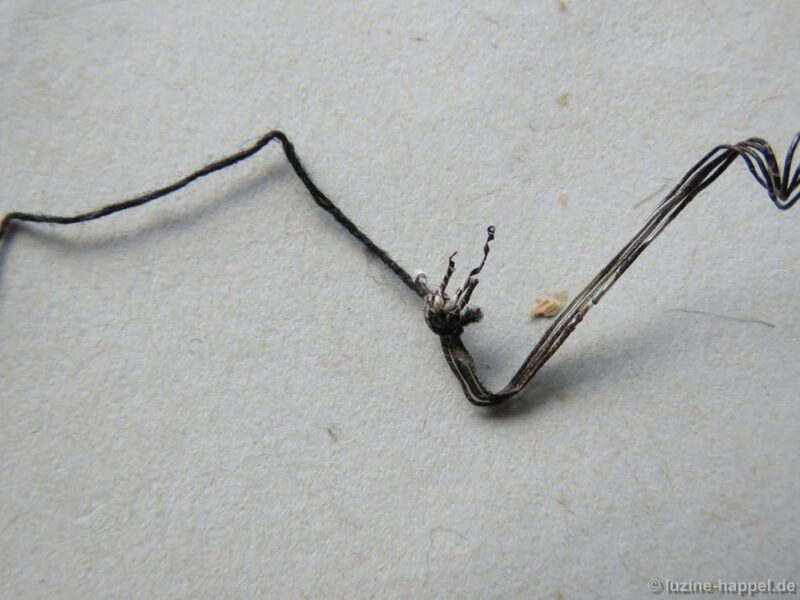 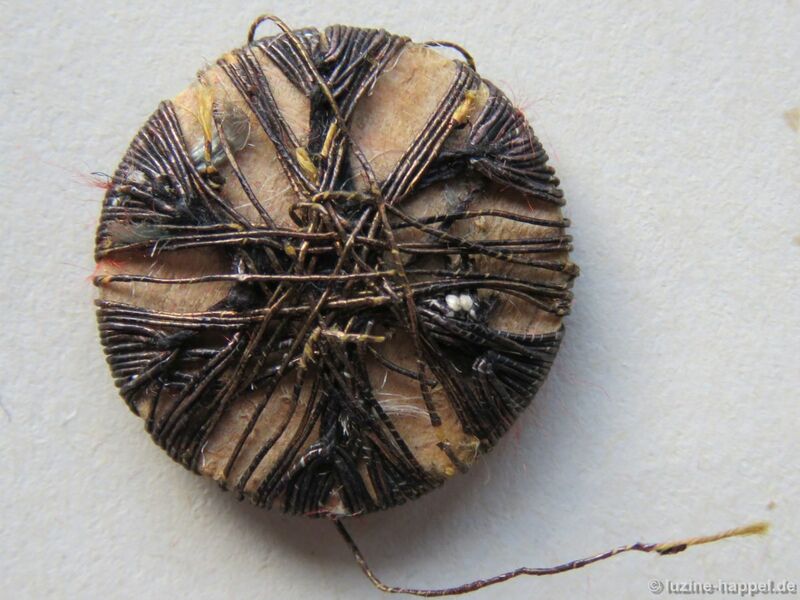 The more flexible metal thread – in the picture it looks like gold wire (it makes sense that the yellow core thread was covered with gold wire, the white core thread was covered with silver wire) – got a knot at one end and was slid under one thread bundle on the back. On the front side, it was woven over the first bundle of metal threads, under the two crossing bundles, and over the fourth bundle. 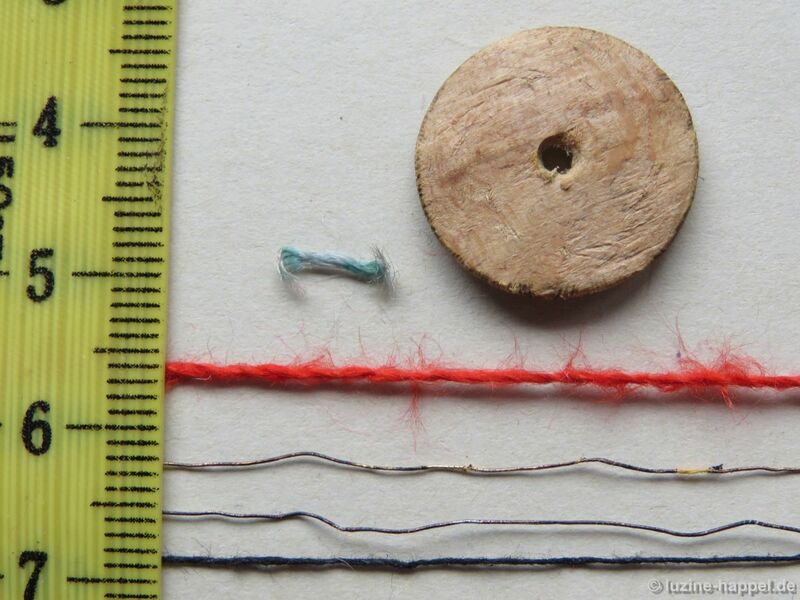 Now the working thread is – seen clockwise – lying before a sixteen-thread bundle. 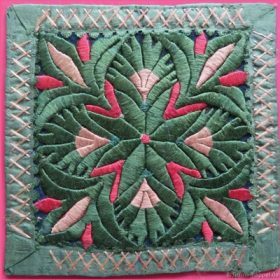 On the back it is brought clockwise three sixteen-thread bundles away and now lies – seen clockwise – behind the third sixteen-thread bundle. 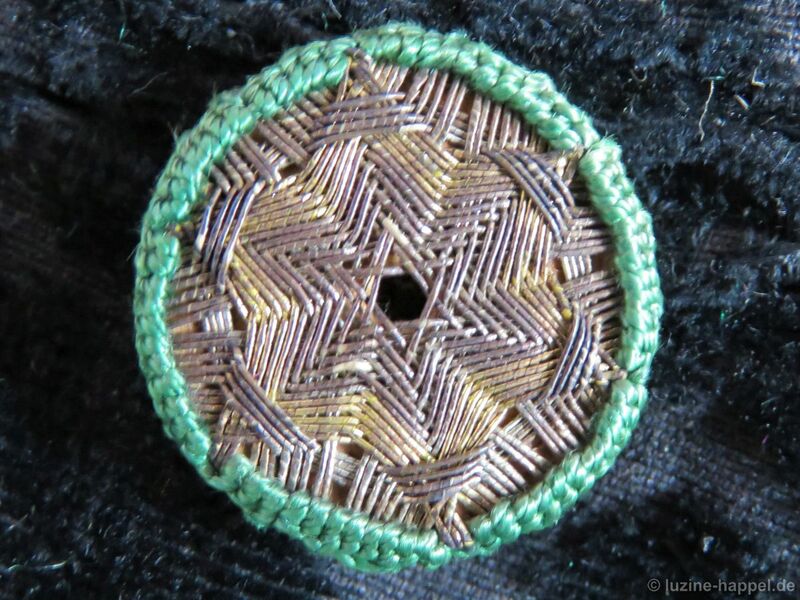 Unfortunately the brittle thread spread out of place, so I marked the position with arrows. 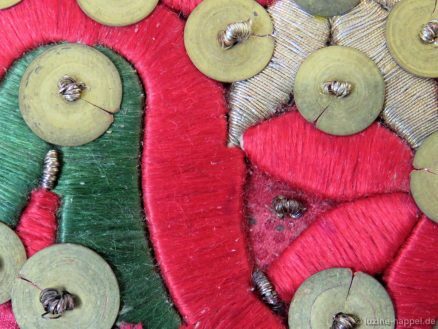 The blue arrow marks the ending of a weaving sequence, the green line marks the thread’s path along the back of the disc, and the red arrow marks the beginning of the next weaving sequence, which is parallel outward the previously laid threads. 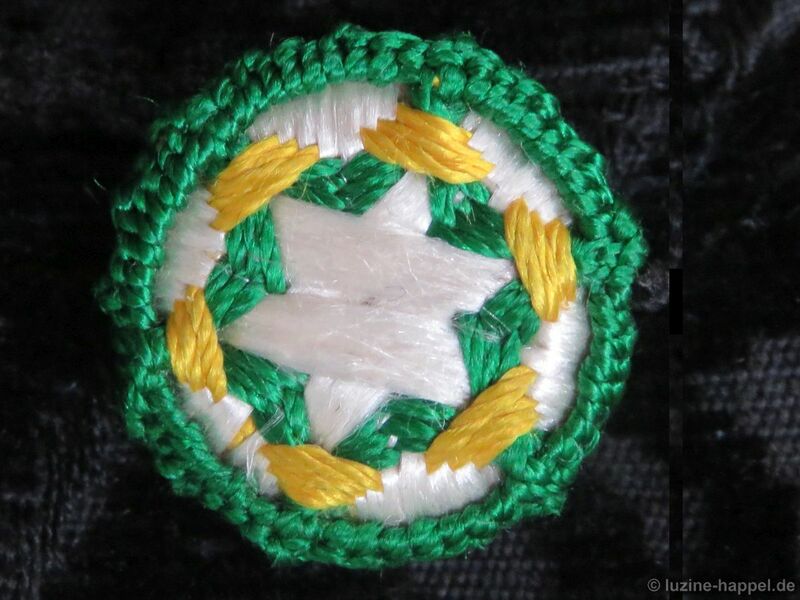 Always in the same way the thread was woven and wrapped until a star with a four-thread edge was established. 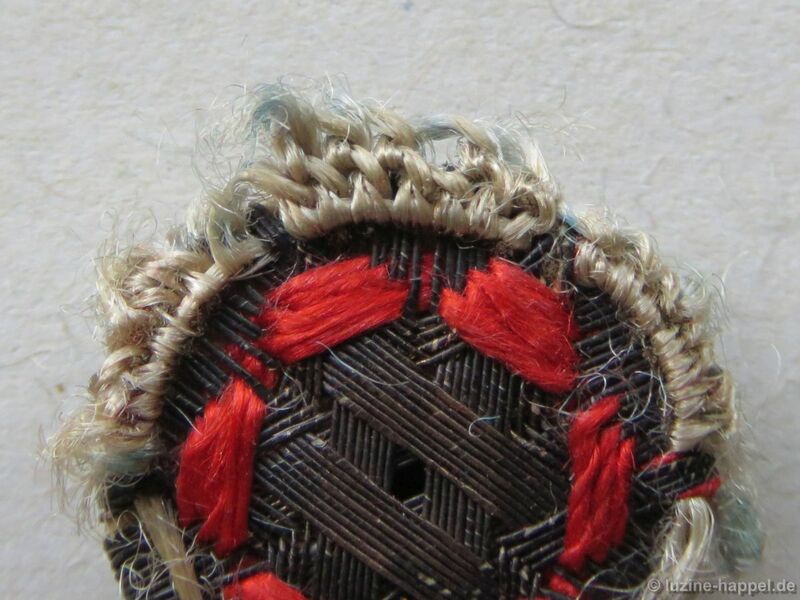 to be brought up at the side of the bundle (see blue arrow) and slid under the laid threads (coming up one thread past the middle). 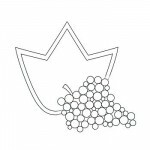 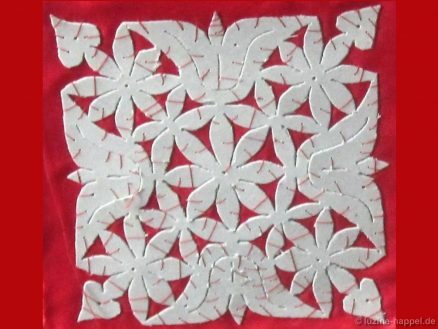 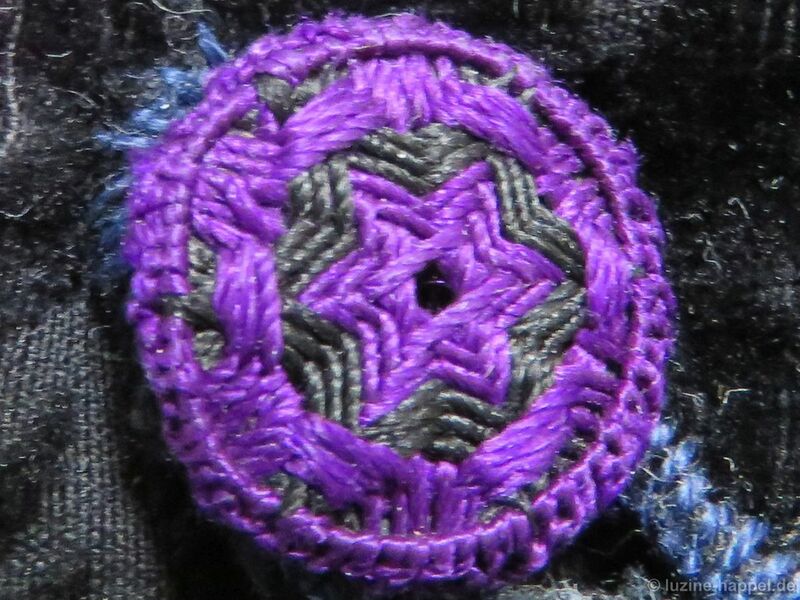 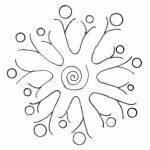 With Running stitches over the points of the established star and under the two middlemost threads of the first laid bundles, a circle pattern is created close to the bases of the star points. 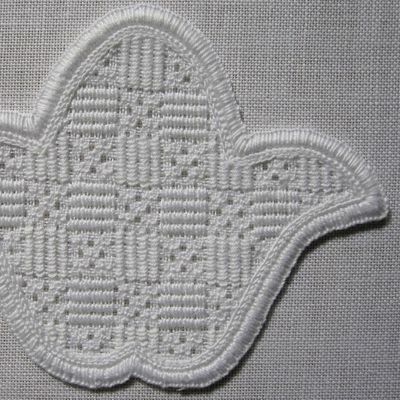 Two more rounds are worked outward with the Running stitches (when they cross the star points) becoming shorter one thread each side and each round. 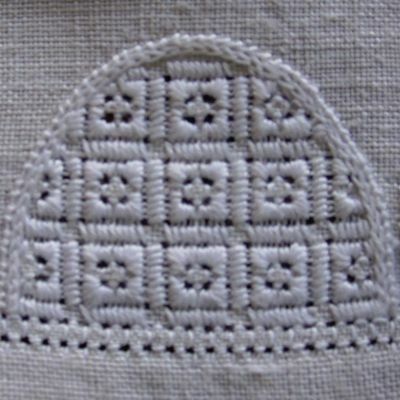 After three rounds of Running stitches, the thread is brought to the back and secured. Now a (formerly green) silk thread was taken up. 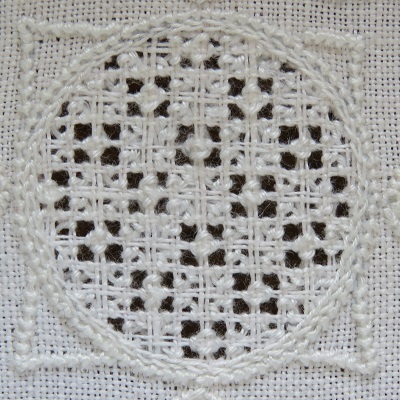 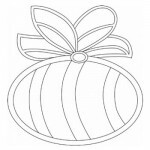 Six Running stitches were worked in a round near the edge crossing always over fourteen of the sixteen-thread bundles. 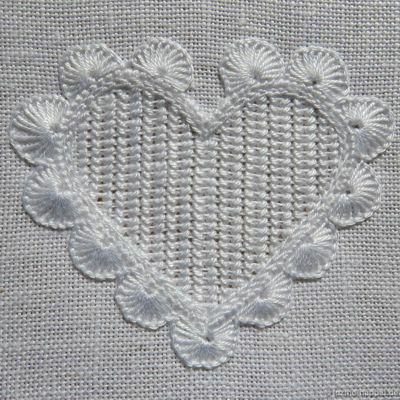 Buttonhole stitches were worked on these threads. 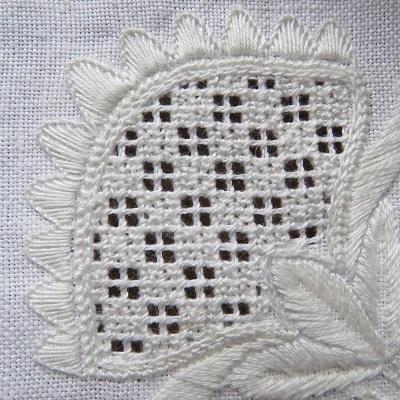 I count seven Buttonhole stitches in each section. 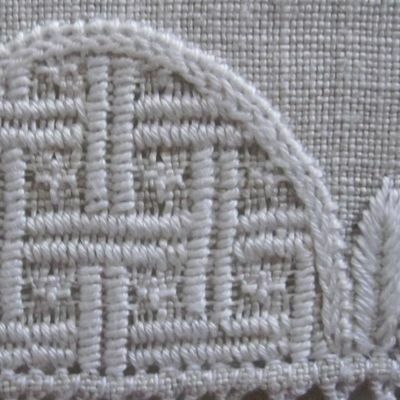 to bring the stitches around the edge. 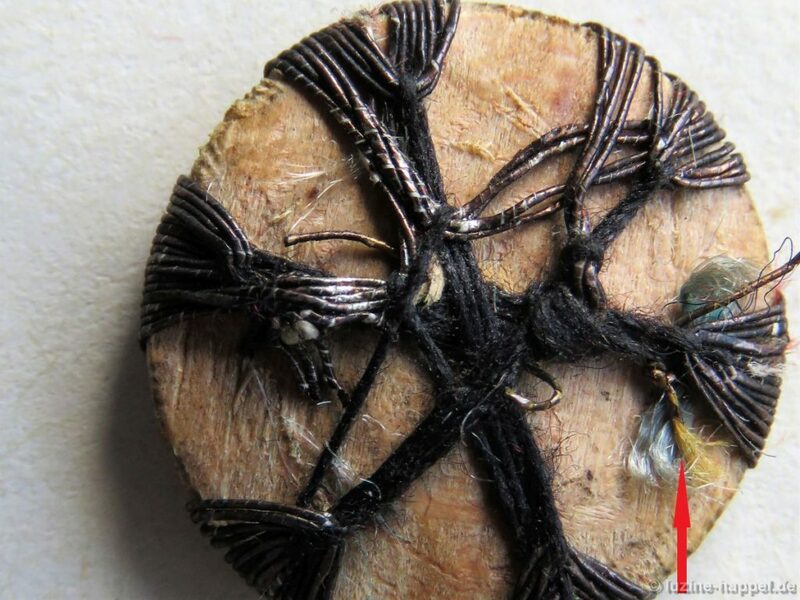 On the back the stitches were fastened by wrapping around previously worked threads. 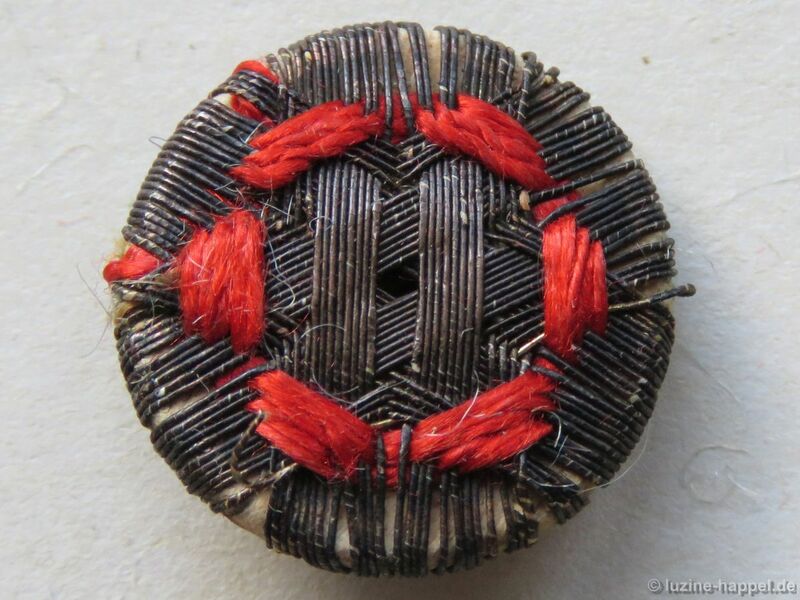 Although considered one of the more simple button designs, a similar, but undamaged, button from the same garment shows the original beauty of these buttons. 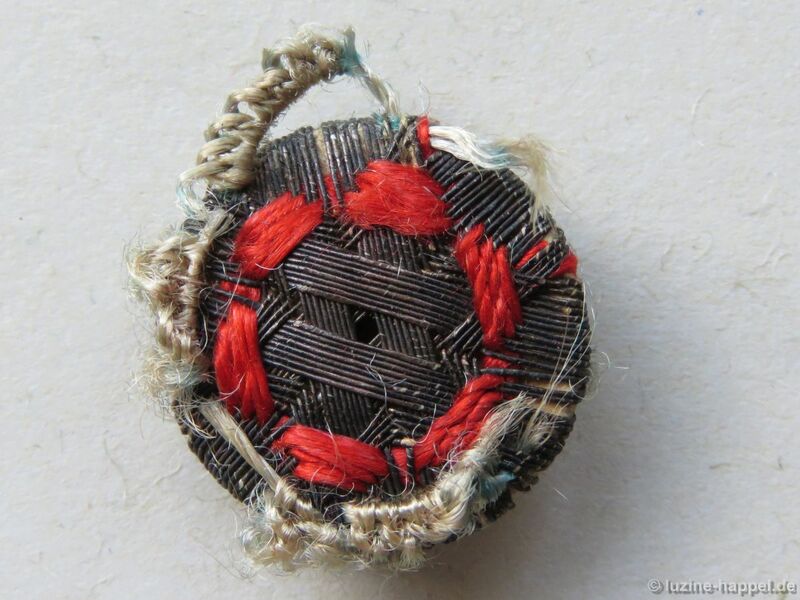 small button! 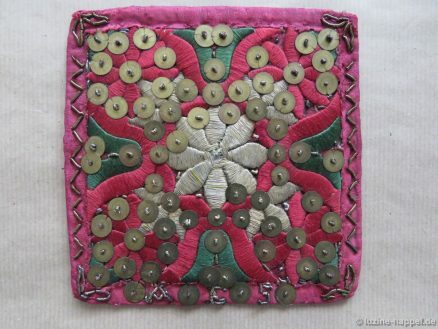 And the garments of a Schwalm woman needed many buttons. 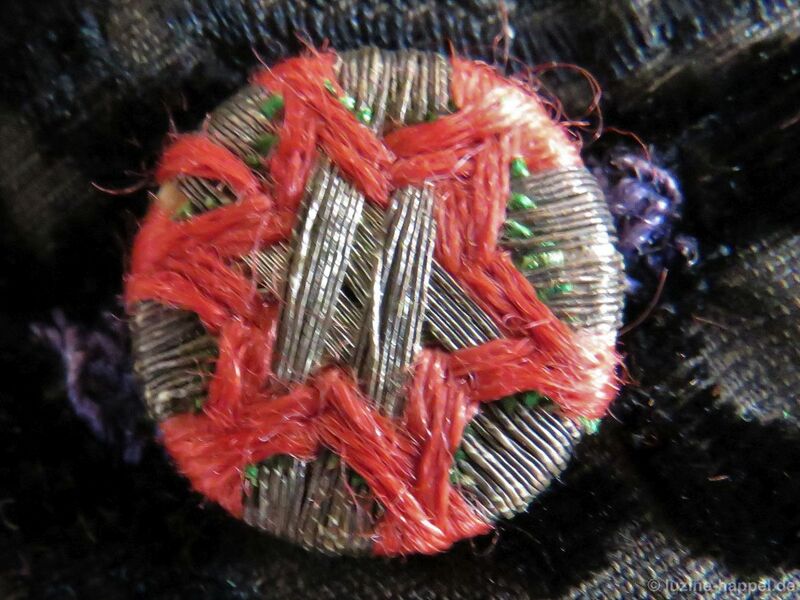 The buttons for the Schwalm women’s waistcoats and other items of dress were passementerie buttons. 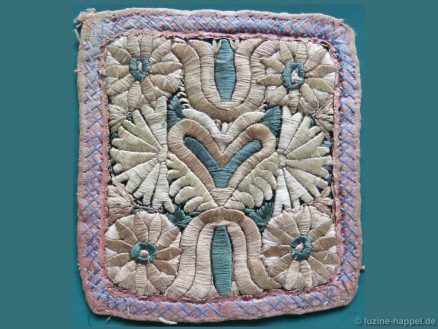 The Huguenots brought this button-making technique to the Schwalm from France at the beginning of the 18th century. 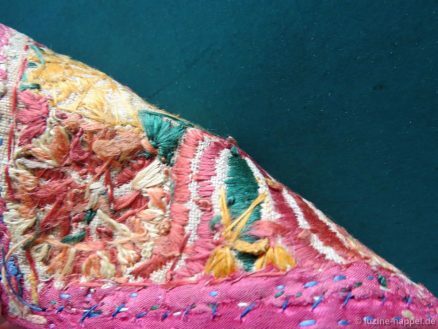 Materials used were gold and silver wires and silk threads in red, green, lilac, and black (matching the festive costume ); white and yellow silk threads were also used, but only rarely. 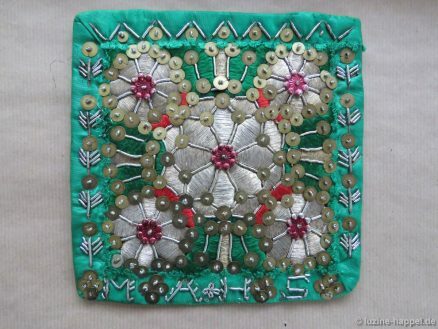 Sometimes only metallic threads were used, and sometimes only silk threads. 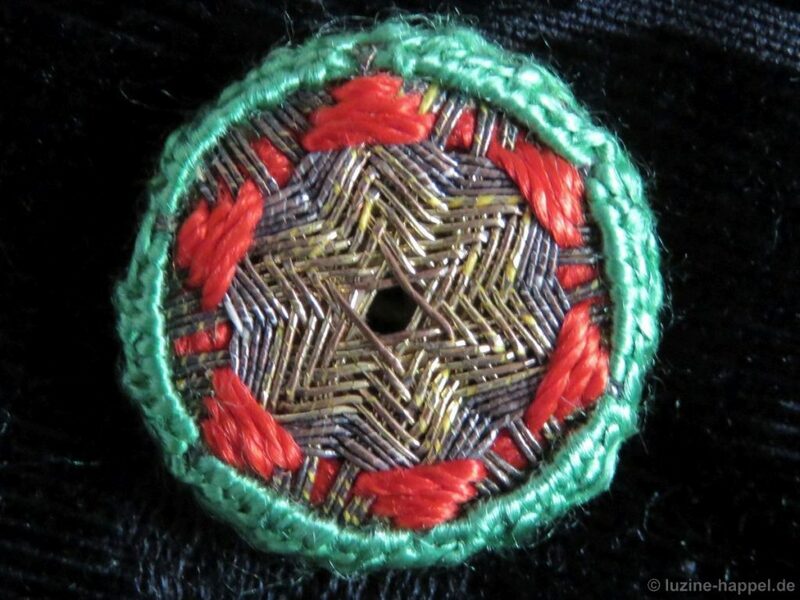 One will see silk-only buttons mostly in the black buttons on mourning garments and in children’s buttons. 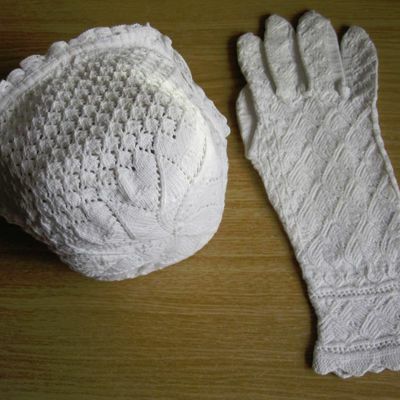 Most common, however, was a combination of both materials. 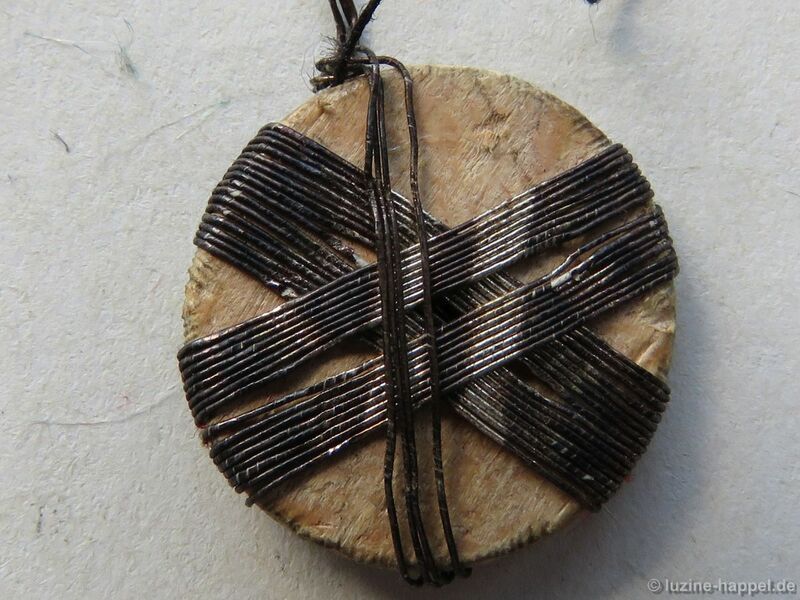 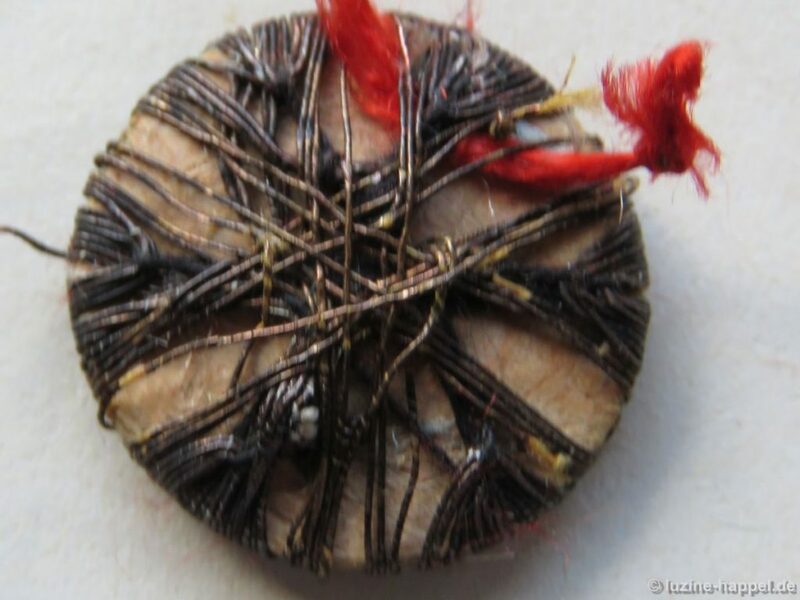 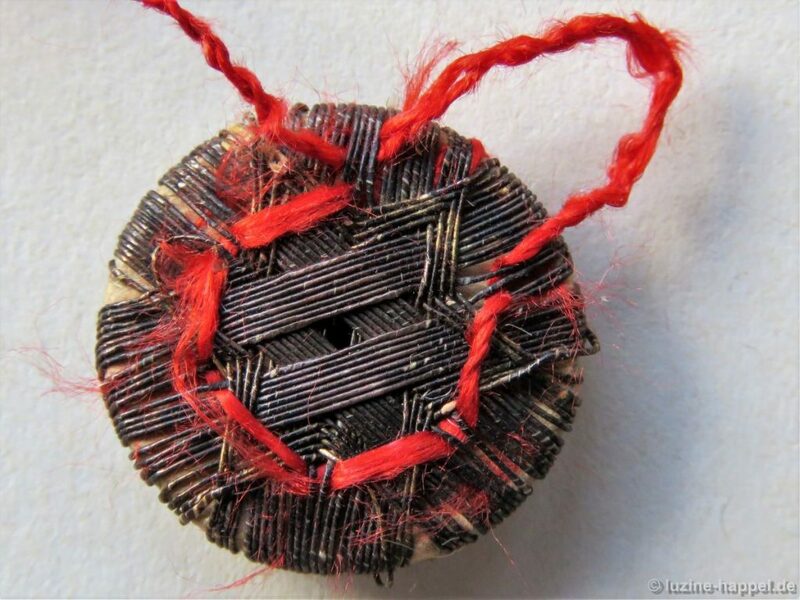 Threads were wrapped radially around a wooden disc that had a hole in the center. 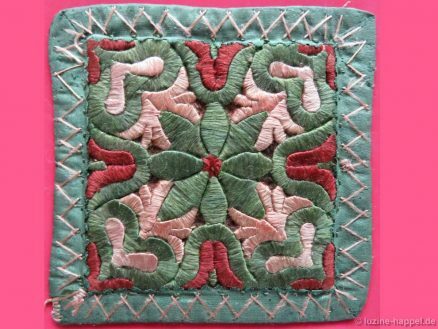 They were held in place with weaving and Running stitches. 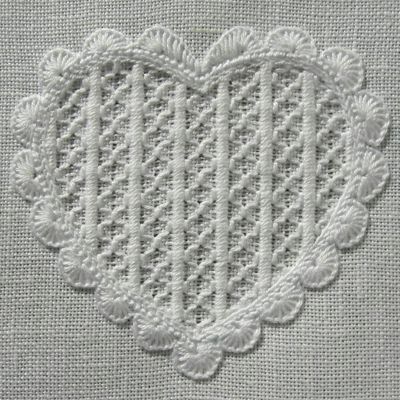 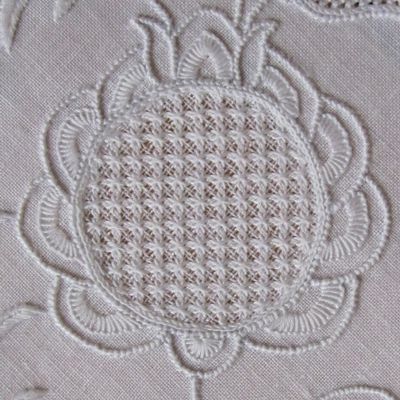 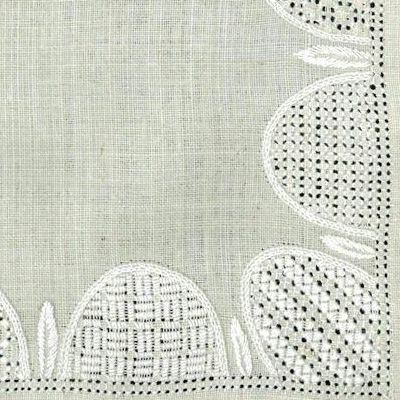 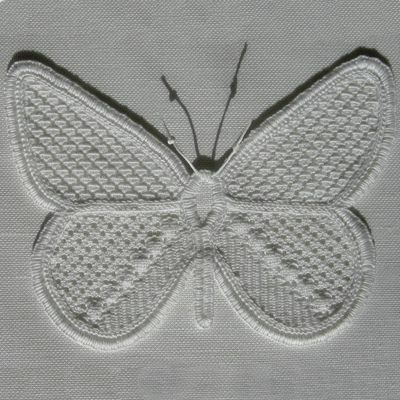 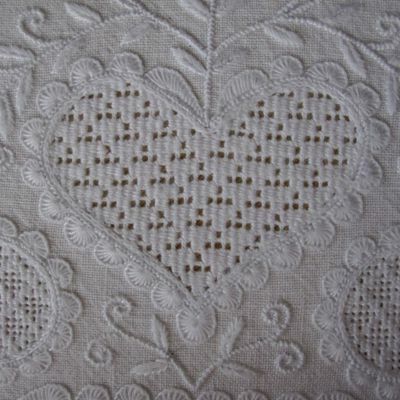 Usually the buttons got a needlelace edging, serving as both an additional decoration and to protect the edges. 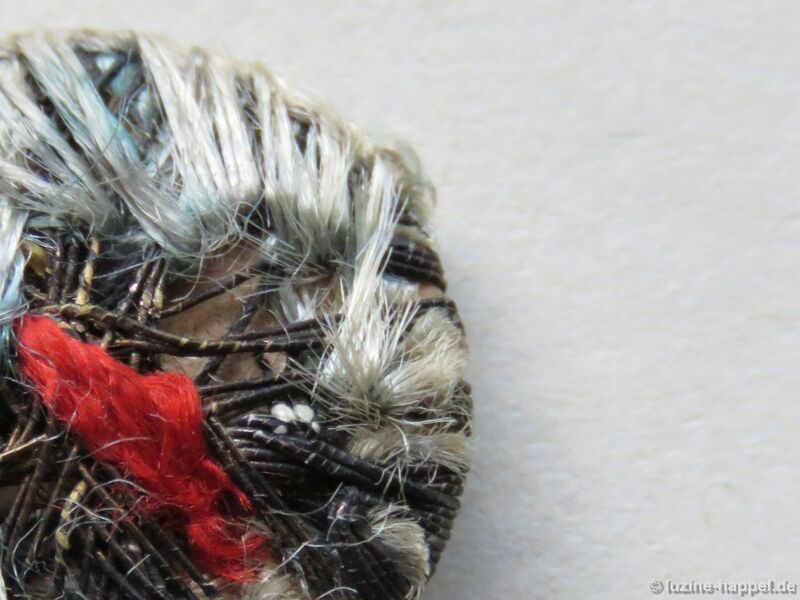 I found two different ways of wrapping the threads. 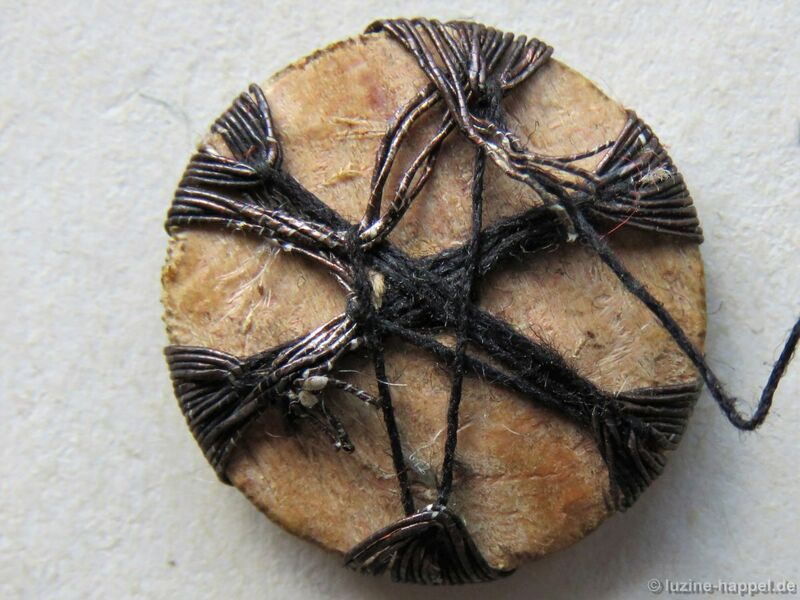 All wrappings create a six-pointed star pattern on top of the button. 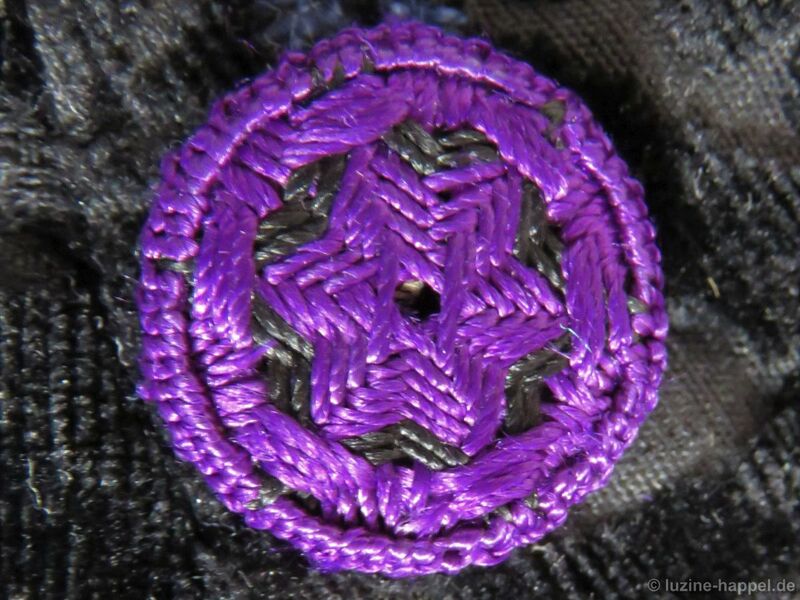 The most common method for establishing a star was to lay threads in two wide parallel stripes left and right of the center and to continue laying similar stripes two more times by rotating the piece 60° and 120°. The stripes were held in place with weaving and Running stitches of different lengths. 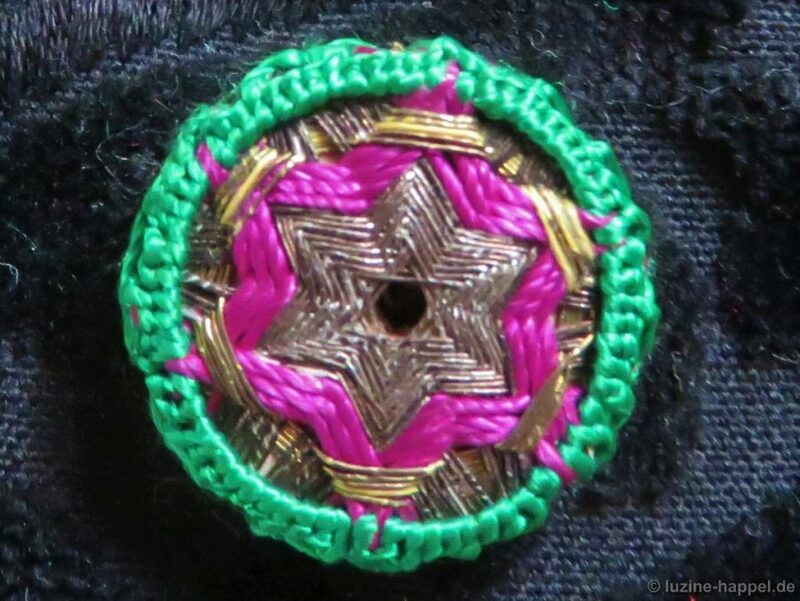 The other method used to create the star was to rotate the button 60° after every two wrappings. 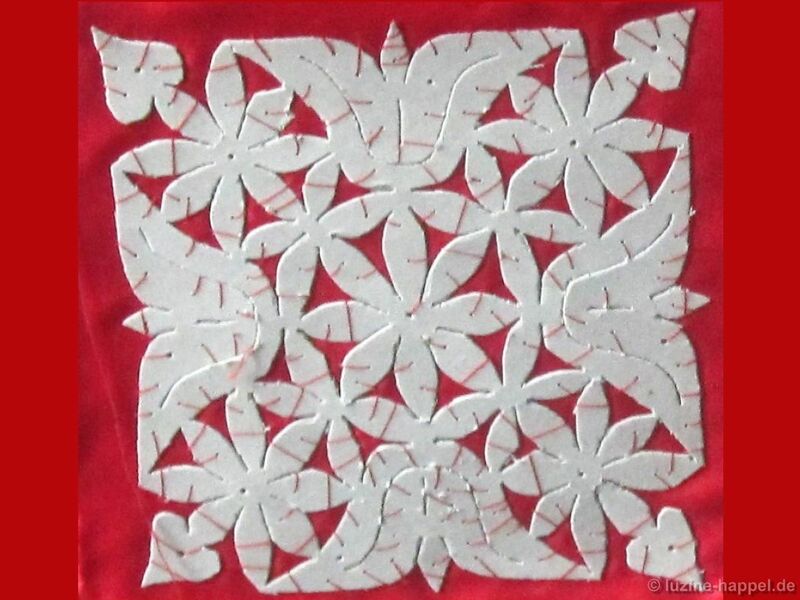 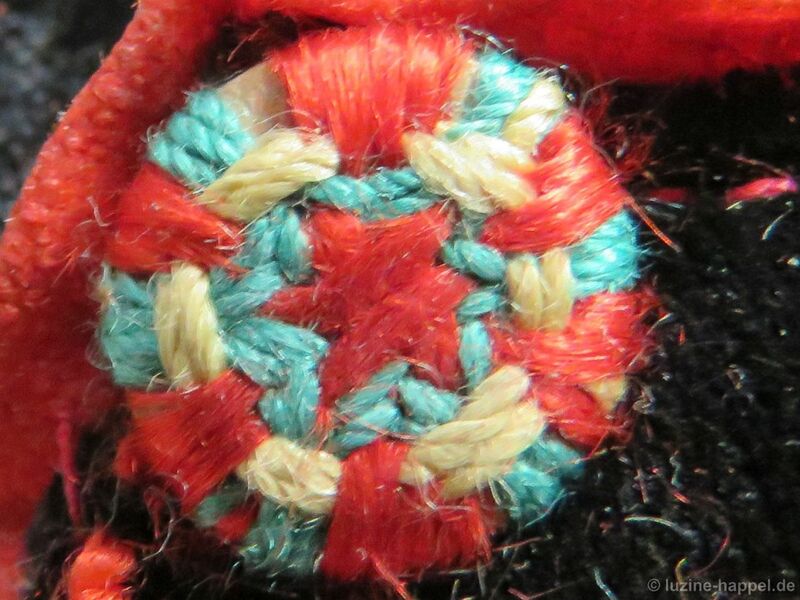 This star was also held in place with Running stitches of different lengths. 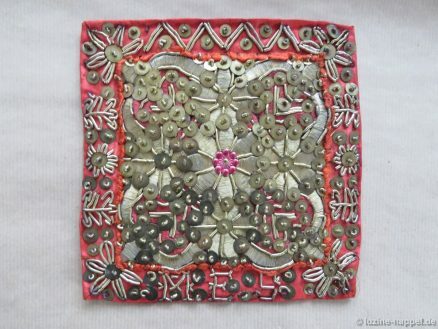 The metal threads tarnished over the years. 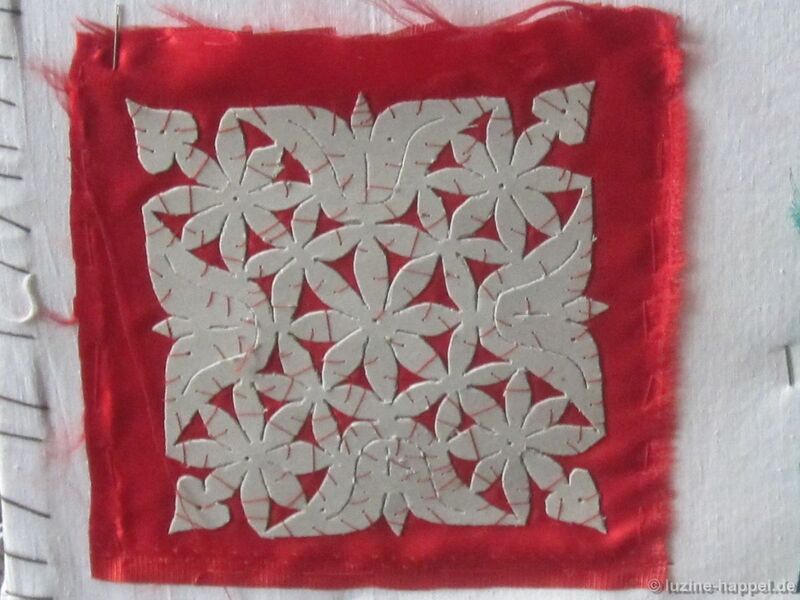 But they can be polished with a special cleaning cloth for silver. 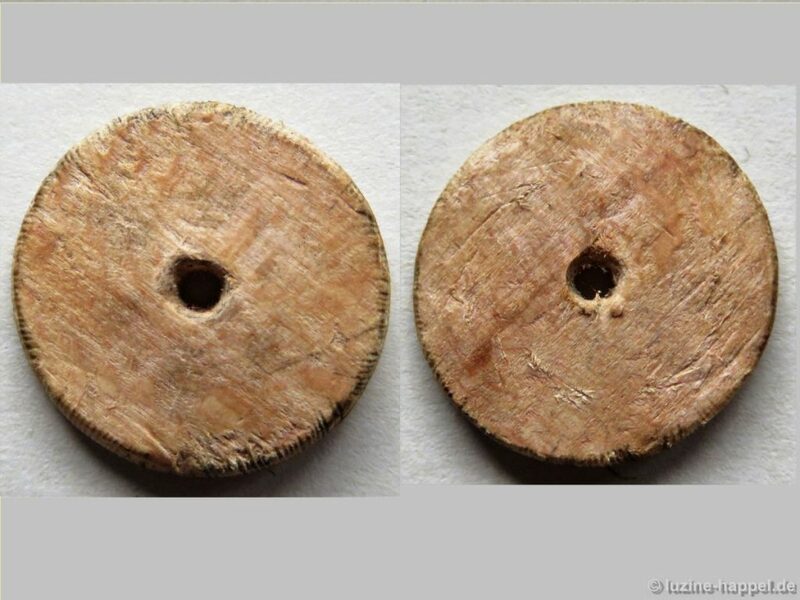 Buttons with a diameter of about 1.8 cm were most common. 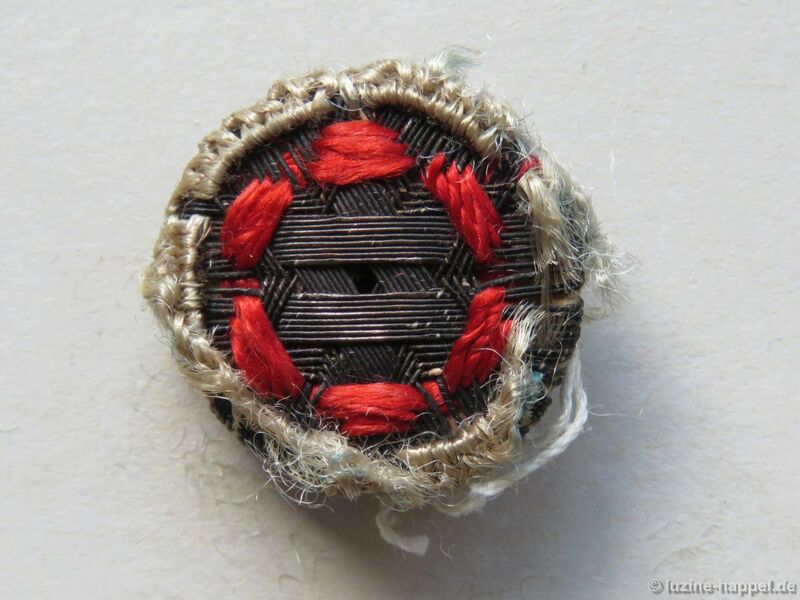 However, the size of the button changed according to the size of the garment. So, children’s garments had small buttons, and women’s garments had slightly larger buttons. 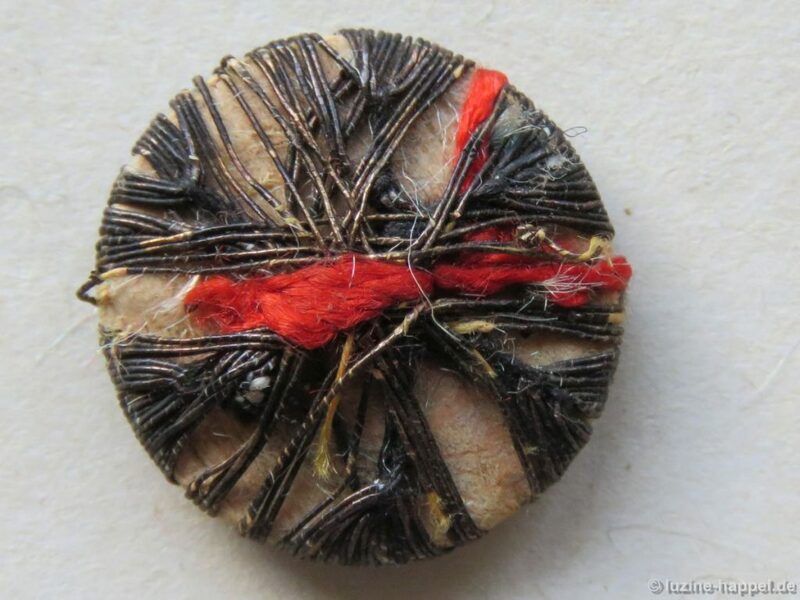 A damaged button shows the inner disc (image above) and the image below shows a similar, but undamaged, button. 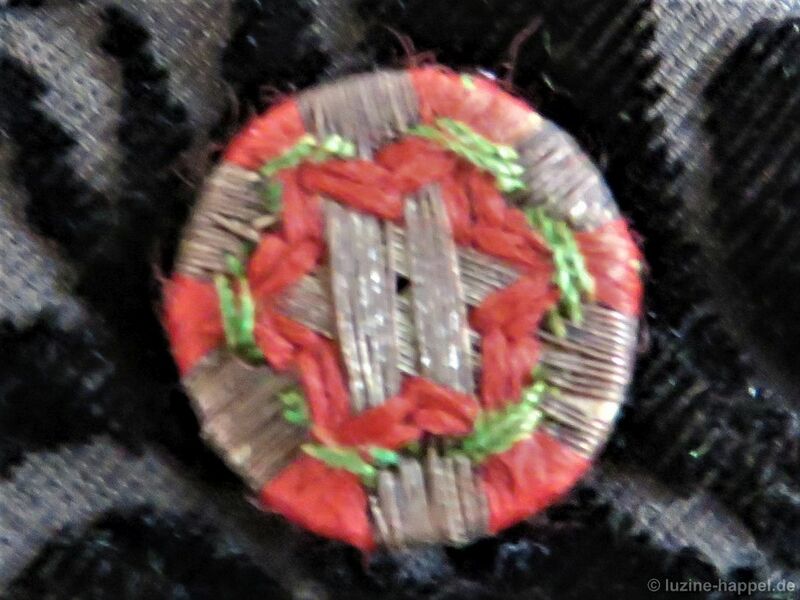 It is part of a child’s waistcoat.